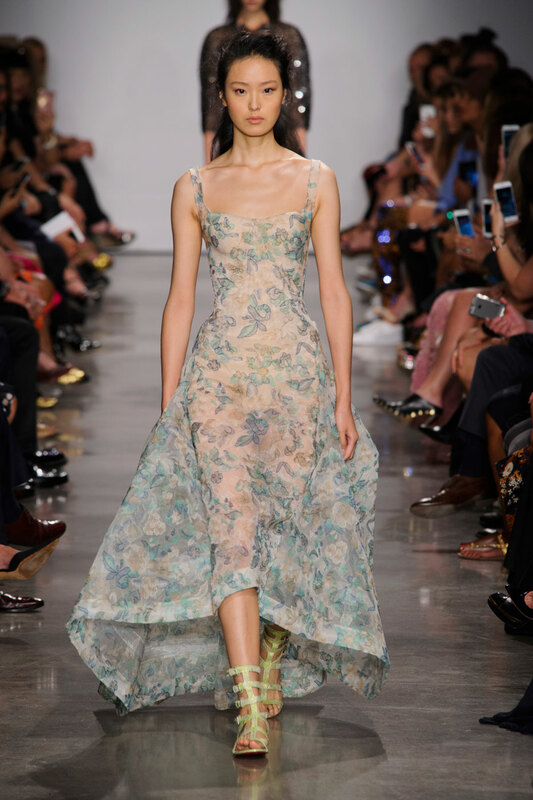 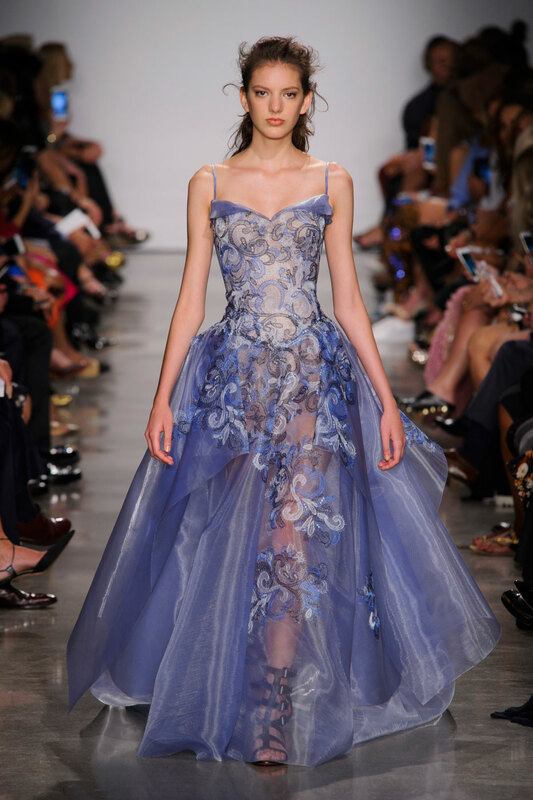 A diaphanous display of sheer graced many runways, imparting a romantic aesthetic with articulate refinement. 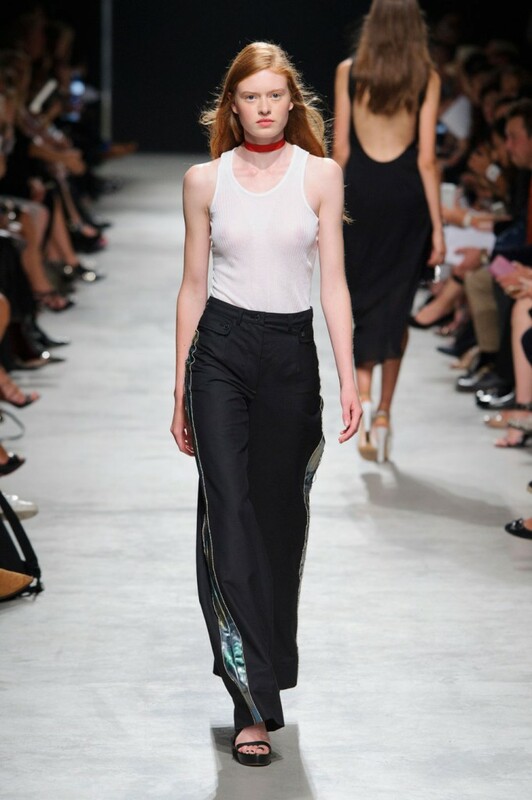 This season, Alexander Wang exposed a sultry vibe through a black slip dress and low-cut, polka-dotted vest; both of which featured subtle, lingerie detailing and were finished off by black sandals with an oversized ankle cuff. 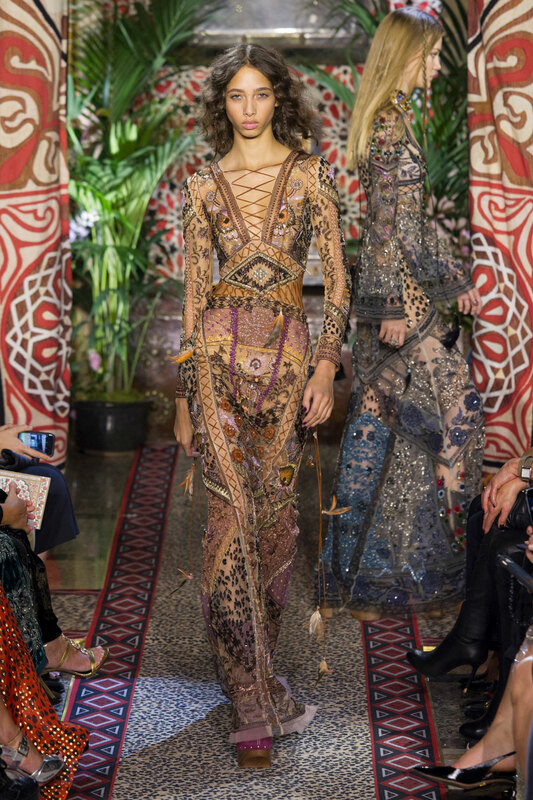 Custo Barcelona created a playful take on see-through, with bold prints and semi-transparent items glossed with a shiny finish steeping the designs in a youthful tactility. 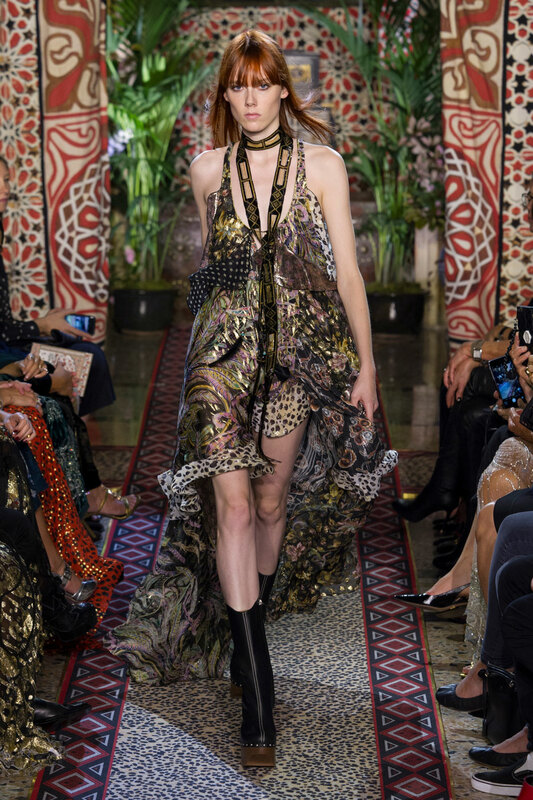 Daringly exotic, Cavalli’s heavily embellished, floor-length dresses provided a striking balance between bare skin and delicate embroidery: busy, loud, yet outstandingly elegant. 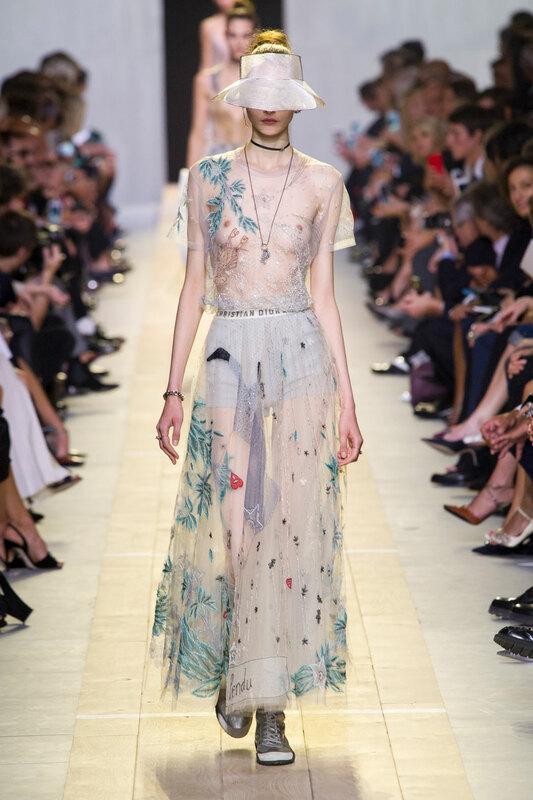 Understated and neutral see-through pieces were on show at Dior; straightforward lines were emphasised by beautiful embroidery composed of gold and turquoise tones, with the transparent fabric leaving little to the imagination. 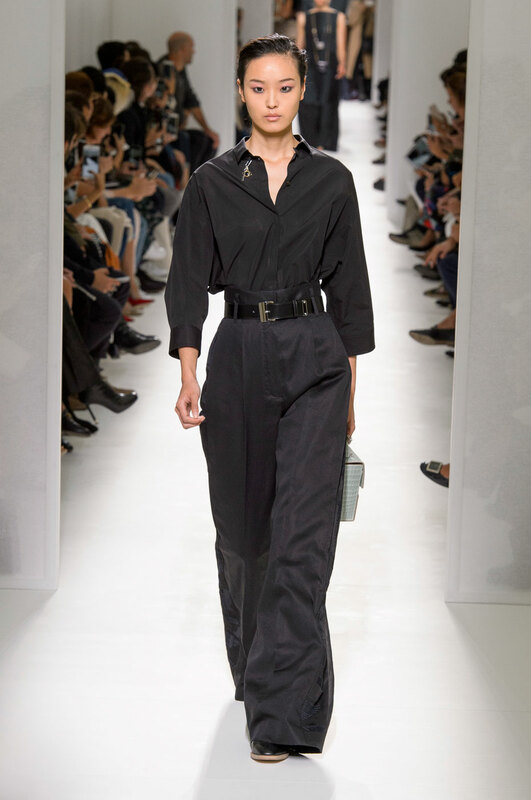 Dark and flowing dresses were a staple at Fendi where floral prints combined effortlessly with the sheer fabric and black studded straps to create an ethereal femininity. 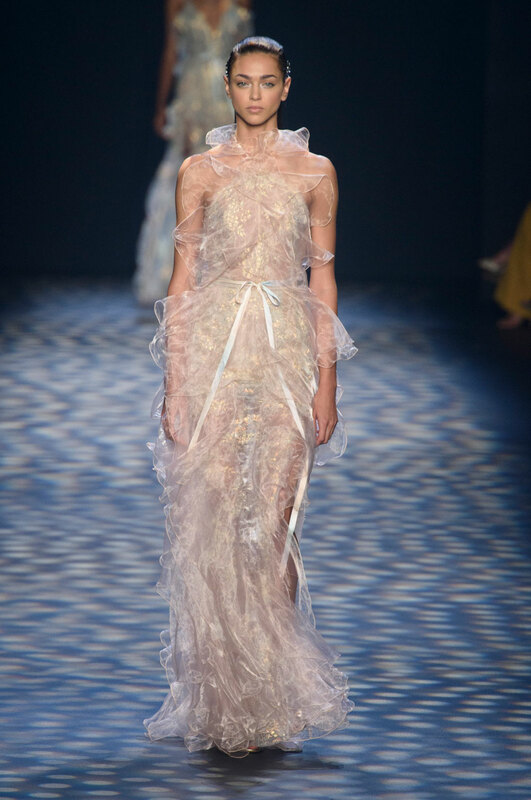 Armani exhibited a glittering display of sheer garments that all had a unique frosted effect through the grey shades and sparkling sequins which dazzled against the bare skin. 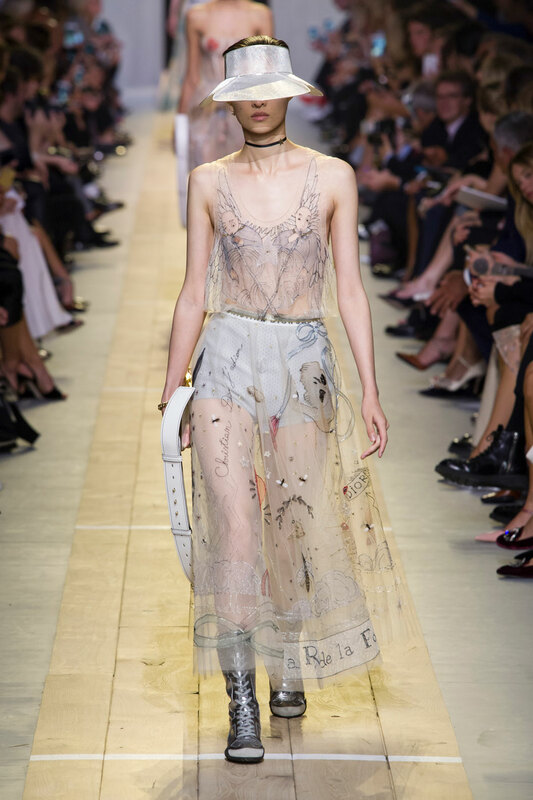 A sheer shoulder was offered by Herrera in the form of this organza halter gown; the folded sheer sleeve equalling out the heavy pattern. 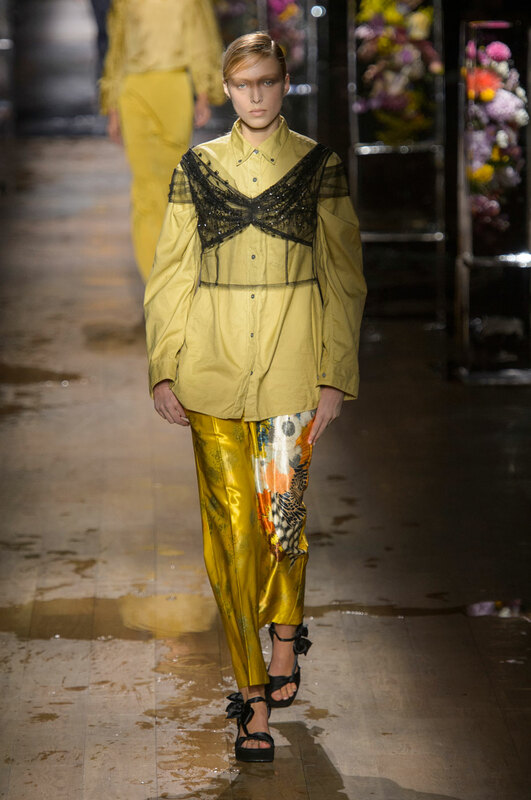 Marc Jacobs spoke to a more eccentric character with the use of sheer panelling and trim toning down bold, paisley tunics and offering a modernised Victorian silhouette. 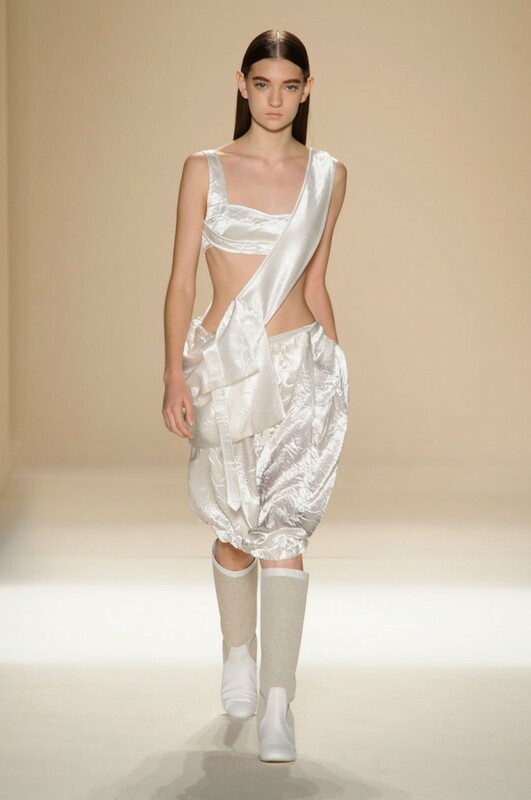 A seductive sophistication was achieved here through the muted palette and gossamer fabric which hung off the body to create supreme softness. 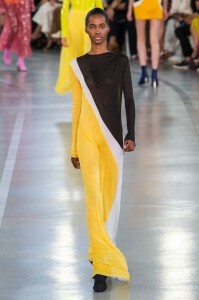 The monotone combination of black and gold used by Krizia provided an ornate gloss to the sheer fabric, allowing the delicate shaping to take centre stage. 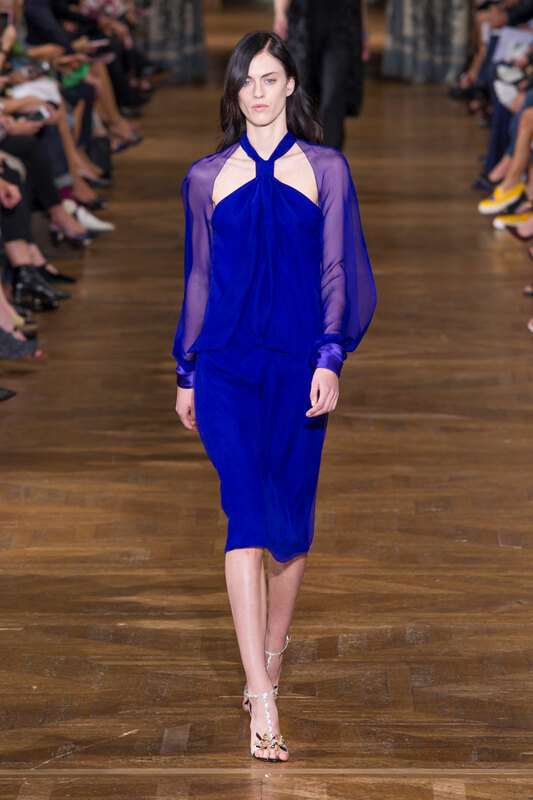 Lanvin mixed the subtlety of the clear fabric with a bold and electric blue to create an outspoken edge. 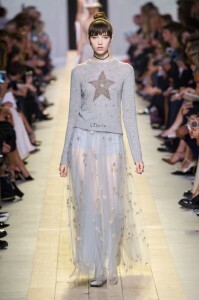 The trend was given a plasticky reconstruction by Guy Laroche, stripping back the designs with the appearance of several transparent knee-length dresses. 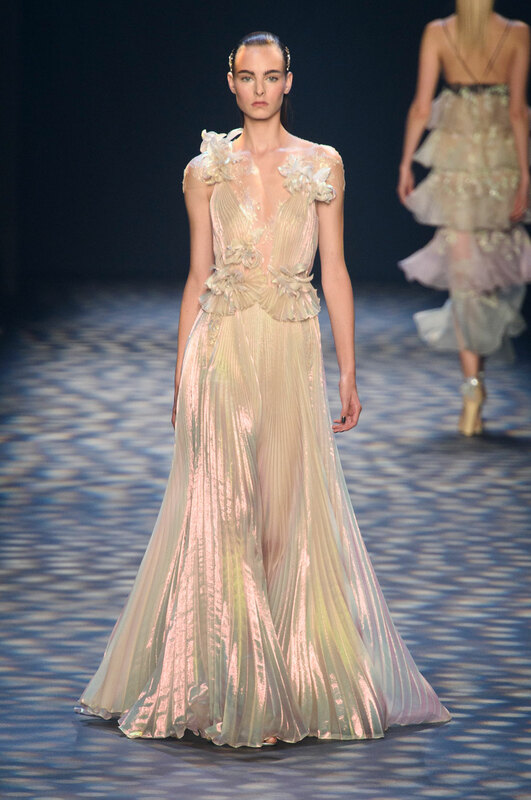 A dreamlike grandeur was mastered by Marchesa, who seemed to capture a Grecian wonderland filled with iridescent lace, layers of tulle and pleated details. 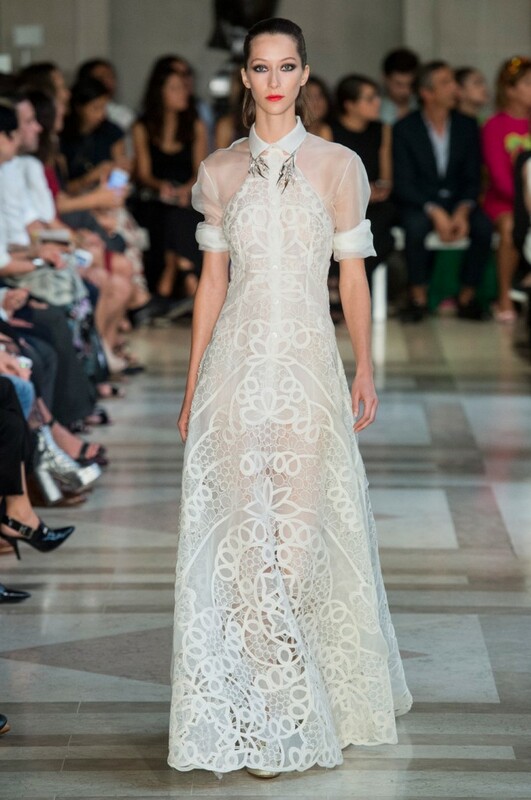 A purity was felt throughout by the delicate designs of elegantly placed sheer. 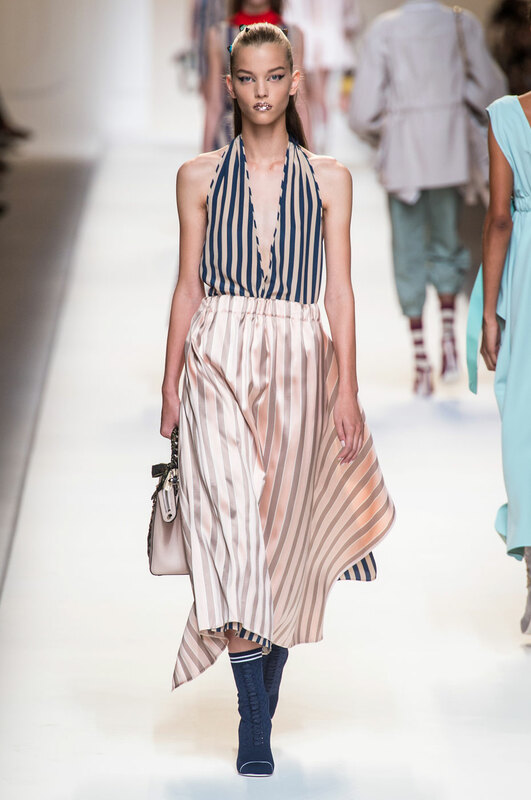 Simple pastel dresses were seen at Ermanno Scervino, with the range of bubblegum pinks and pale aquas working with honeycomb detailing and sheer boat necks to create a romantic allure. Zac Posen did not shy away from colour in his use of the trend, with the bold colours of deep reds and purples emphasising the gloss-like quality of the sheer material. A redefinition of lines and shapes was achieved through this trend, offering up a range of silhouettes through the creased construction. Saab addressed an opulent take on the trend, with a lamé construction complimenting a contrasting lapel detail and tailored fit; a glitzy upgrade to a masculine classic. Bottega Veneta’s off-copper coat exemplifies an exaggerated sense of elegance, with the brown leather belt bringing definition to the waist and counteracting the stiffness of the leather. 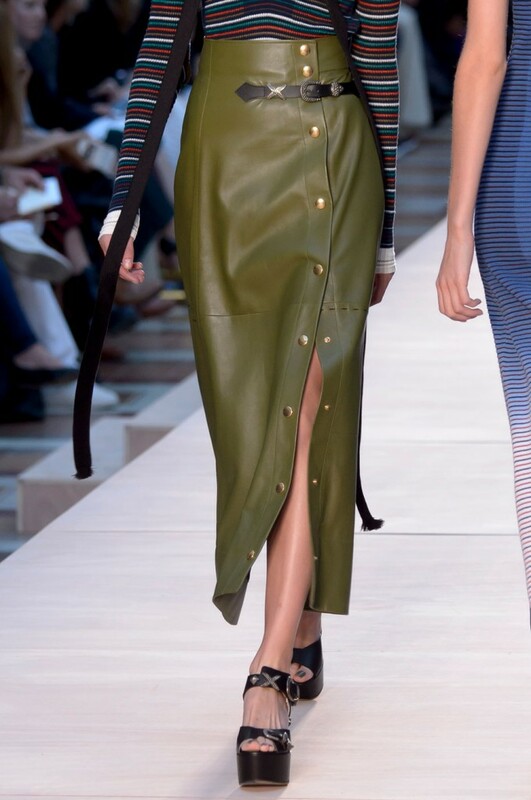 Fendi captured a regal ease, exhibiting a range of silhouettes through the waist-line placement; gathered and high-waisted skirts gave a fluidity to floral skirts, while a thin and low-rise waist elongated the body and intensified the curved print. 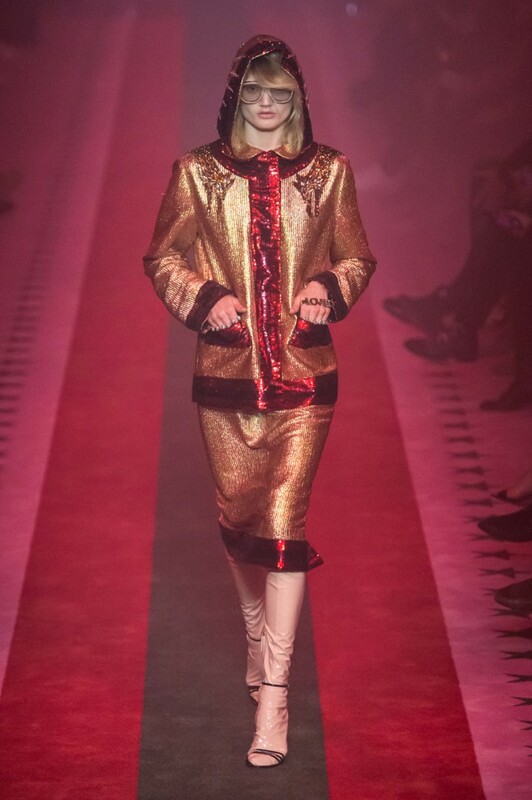 A two-tone dynamic of a rich red and gold illuminated the silhouette in Gucci’s skirt-suit, where the wide, red outline reconfigured the body’s lines. 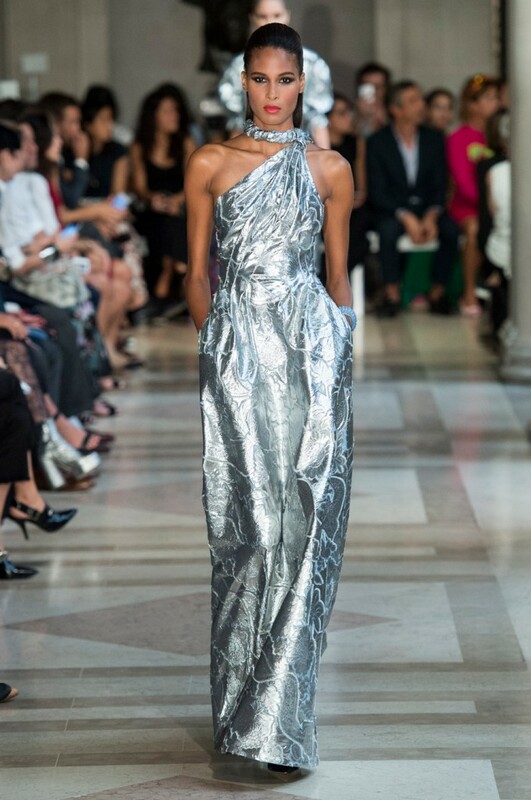 A phantasmagoria of illusion and mystery was achieved through the crackled effect of Herrera’s gowns; the metallic finish gave a glossy texture to the lamé jacquard arrangement while both the one-shoulder design and slightly puffed sleeves added a dramatic dimension. 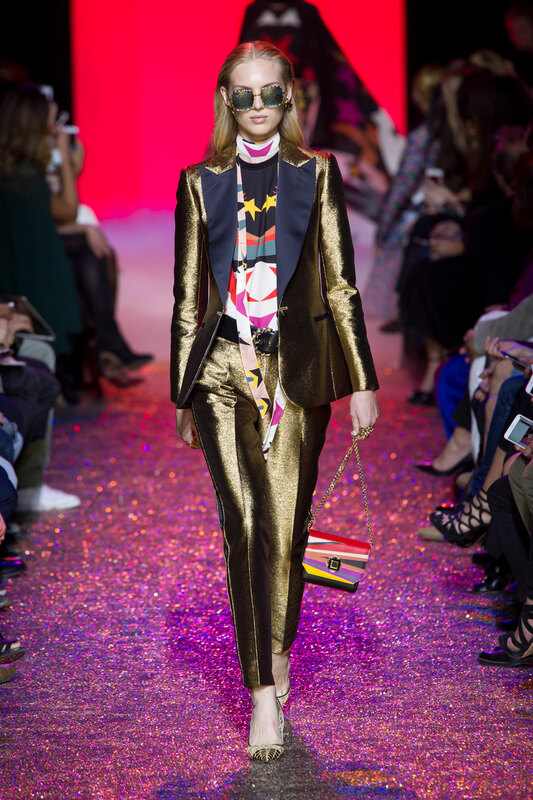 Indulging in sparkles, sequins and satins, Marc Jacobs introduced a plethora of colour which was slightly toned down by the ruched detailing and figure-hugging belts. 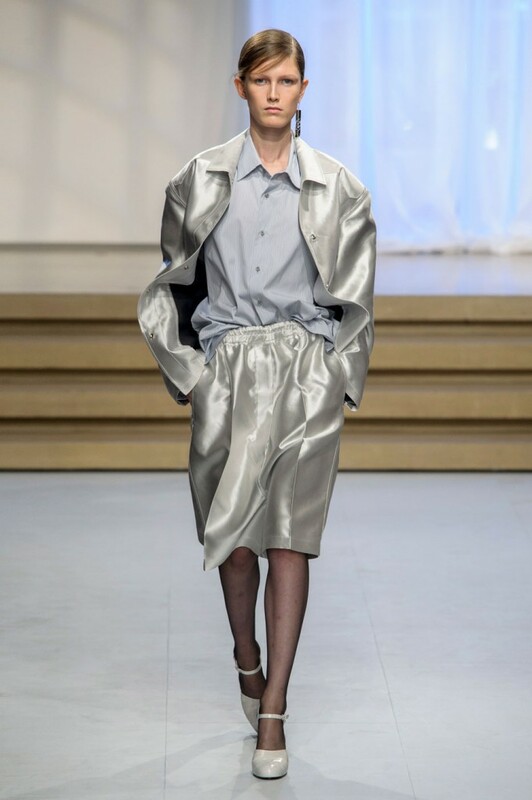 Oversized and boxy ensembles were showcased by Jil Sander who used gathered material to reconstruct silhouettes; chinched hems gave a relaxed feel while the silver shine elevated the masculine lines. 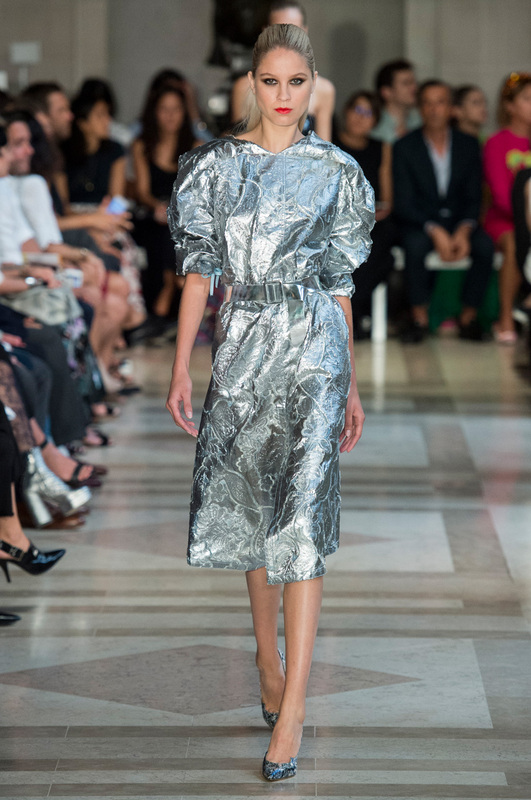 The translucent texturing used by Guy Laroche gave a synthetic resilience, with the plasticky creases contrasting to some of the softer looks offered by other designers. 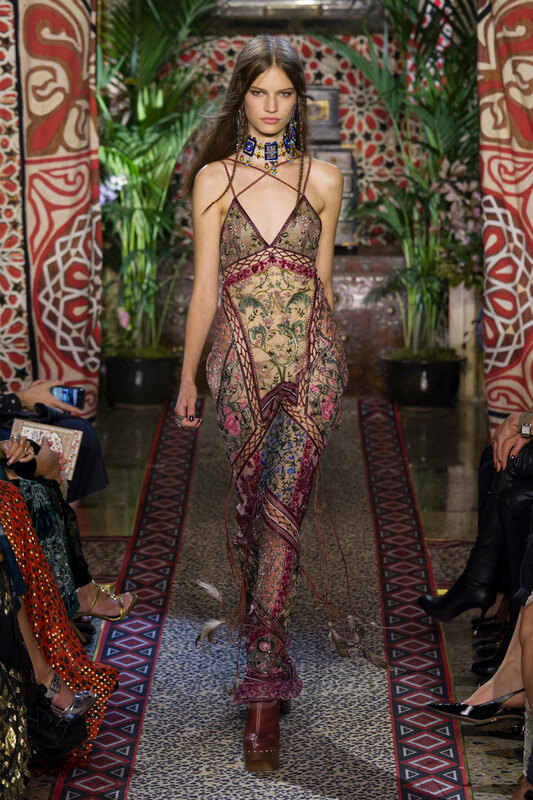 Opulent gowns consisted of deep pleats and draped fabric to create aurelian masterpieces, the cinched material imparting a majestic appeal. 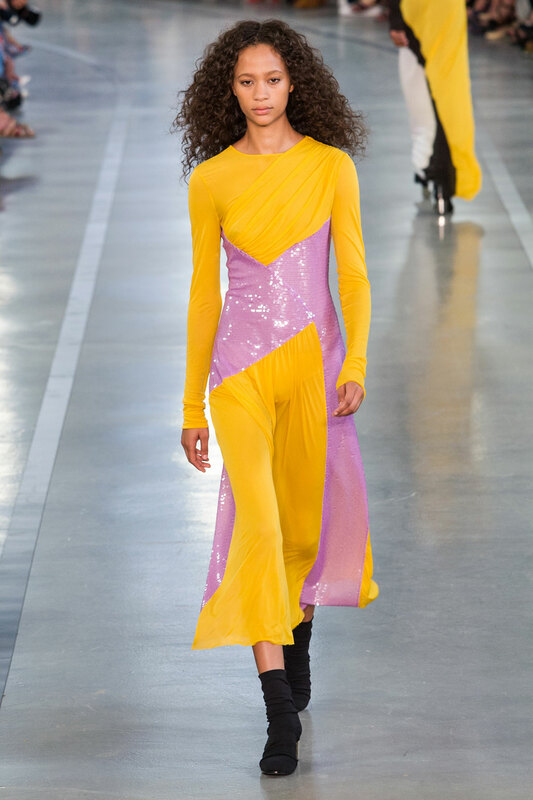 A scoop neck and flared sleeves emphasised the trend at Phillip Lim, where the plush fabric enwrapped the model in such a way that highlighted the shiny material, allowing the creases to produce a delicate fragility. 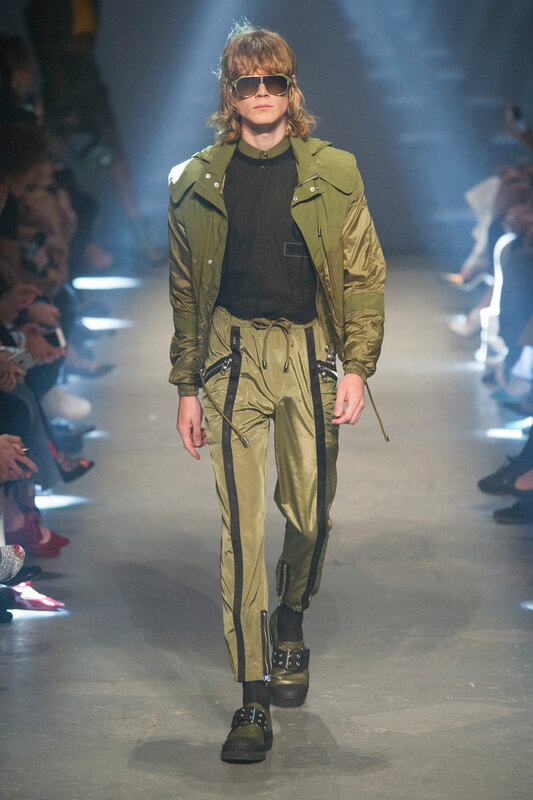 Creased jackets, metallic crinkles and golden etched detailing all debuted at Philipp Plein’s show. 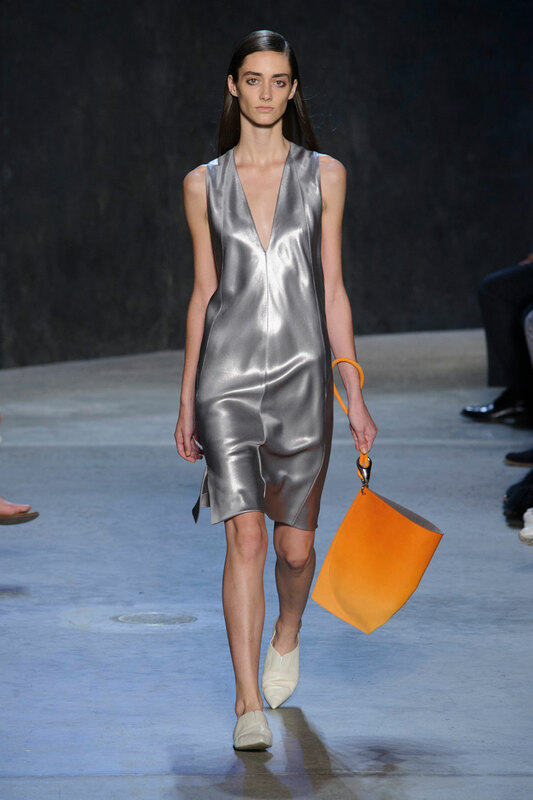 Deep silvers and polished greys slinked over the models with the v-neck form accentuated by the sleek satin material which gave an unadulterated gentility. 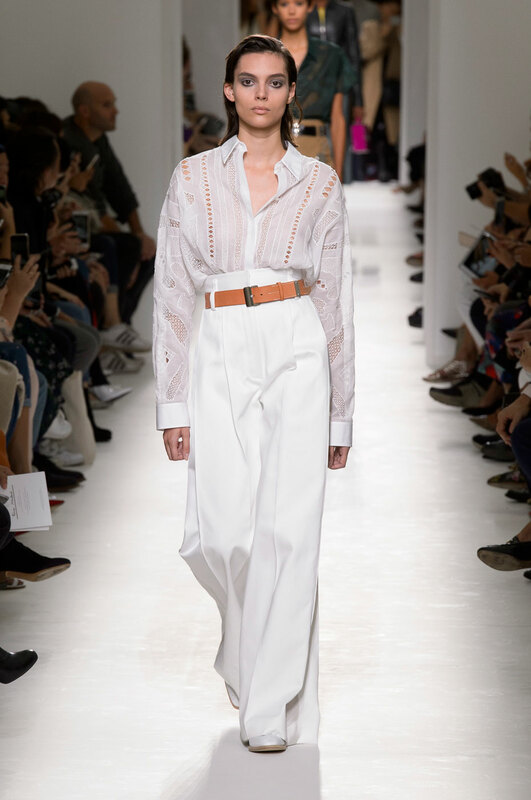 Victoria Beckham tamed the trend by displaying demure, off-white textured silk and velvet to create deconstructed outfits with comfortable silhouettes. 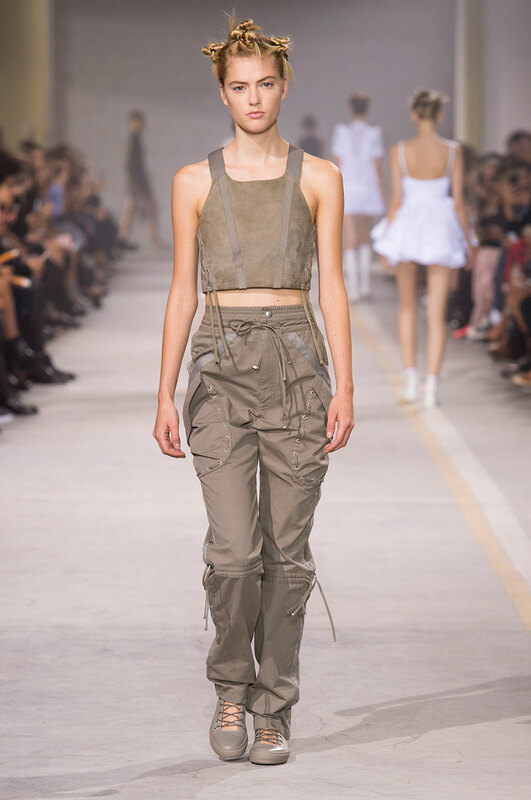 Hard-hitting and aggressive, the military trend is back and bigger than ever, stomping a vigorous foot onto many SS17 runways. 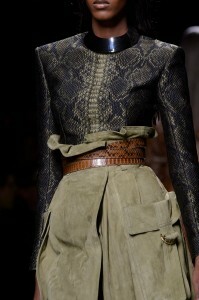 A structured silhouette was created through black waist belts and leather cord trims at Altuzarra. A jungle army was sent down the Balmain runway, with earthy colours facilitating the snake-skin textures and suede cargo pockets to produce a contemporary elegance. 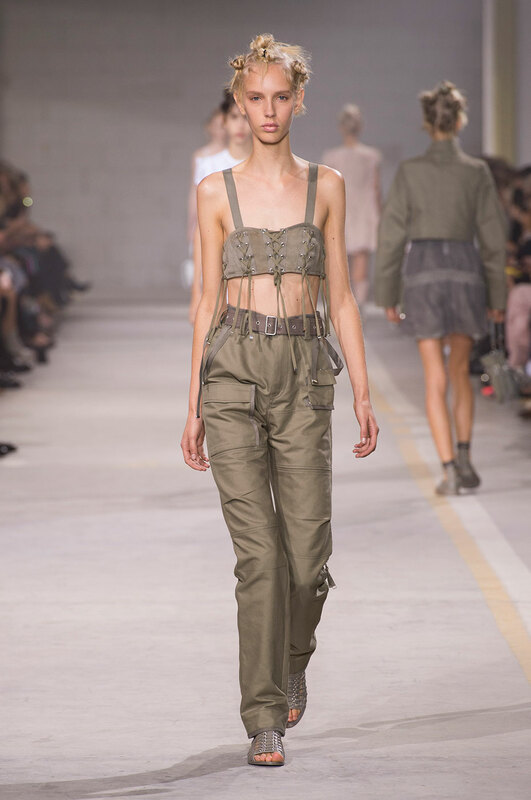 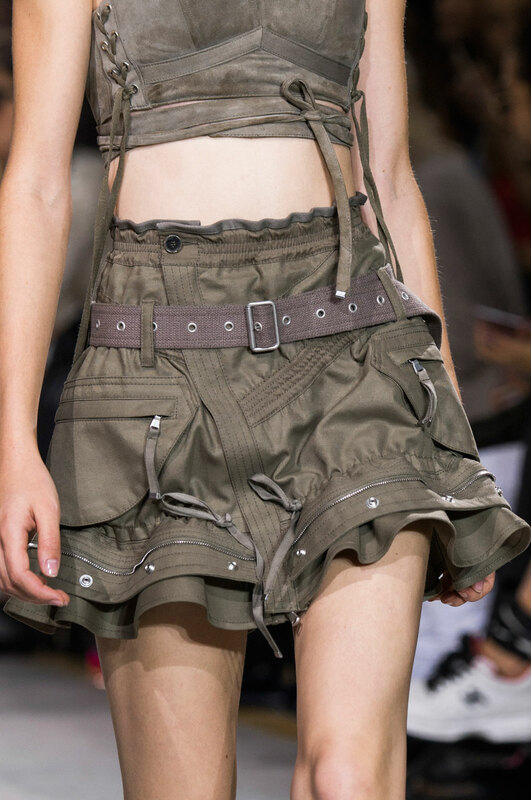 Diesel made a strong statement through their utilitarian pieces, dull greens and greys forming the palette of rustic skirts comprised of zips and poppers as well as a bustier top featuring criss-cross lace. 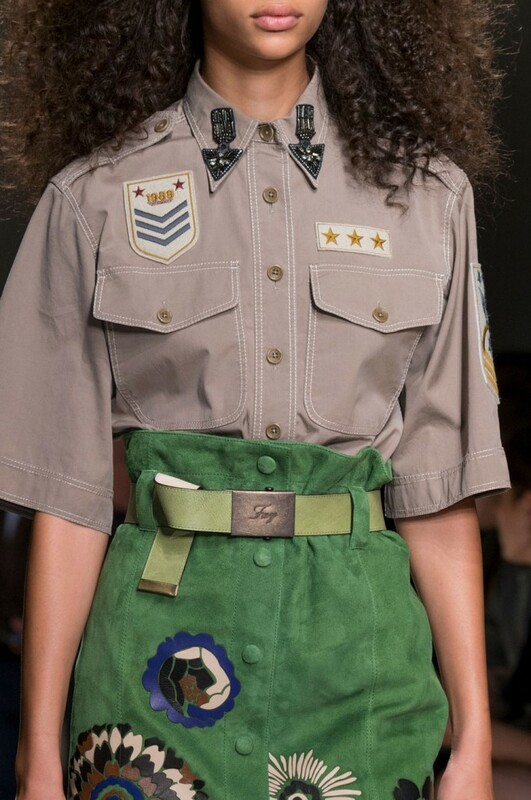 Shades of greens and blacks featured in the Fay show, where appliquéd patches paralleled military officers and boxy shirts were softened by floral detailing. 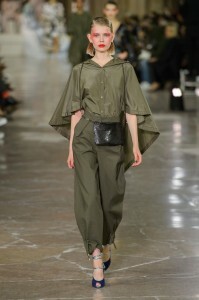 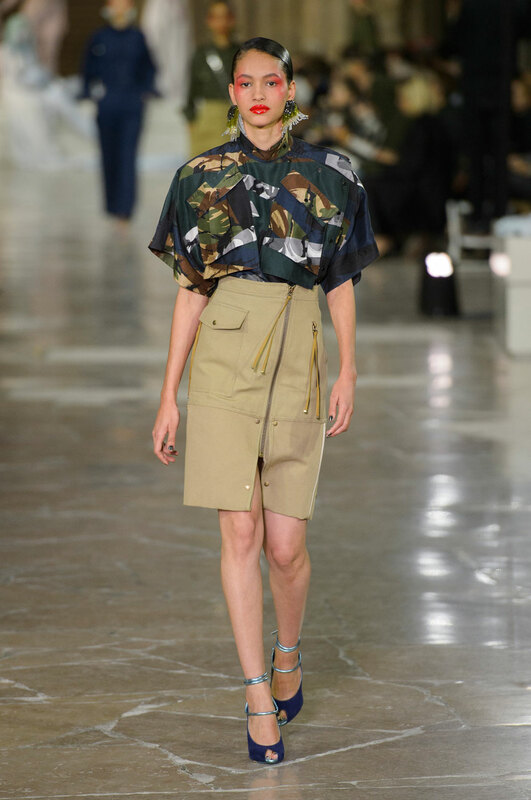 A military rawness was evoked through khaki pencil skirts and high-waisted trousers while a hooded cape blouse with drawstring hood produced a modern interpretation of the classic camouflage motif. 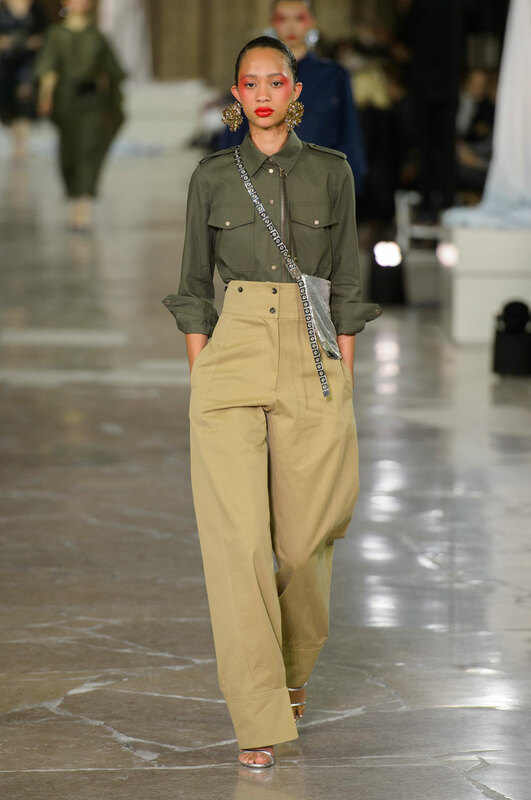 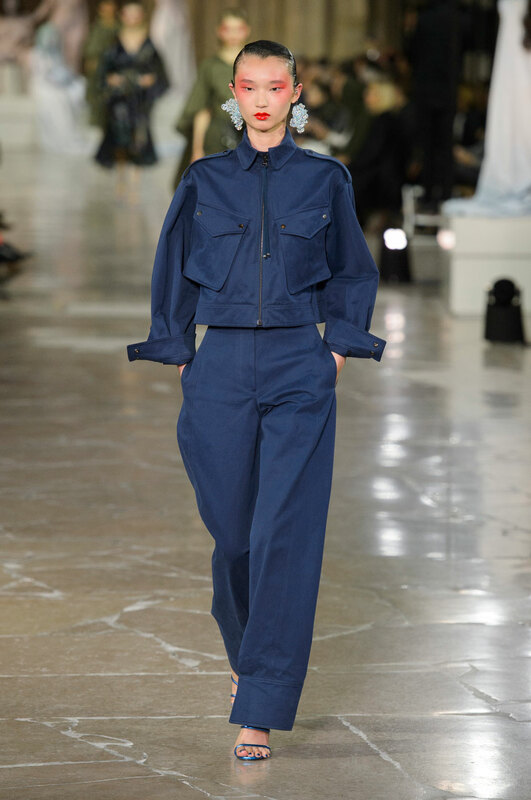 An atypical interpretation of the military theme through an absence of the commonplace green, Guy Laroche presented camel cotton pants with a twisted belt design as well as a ribbed-collar jacket with overextended shoulders. 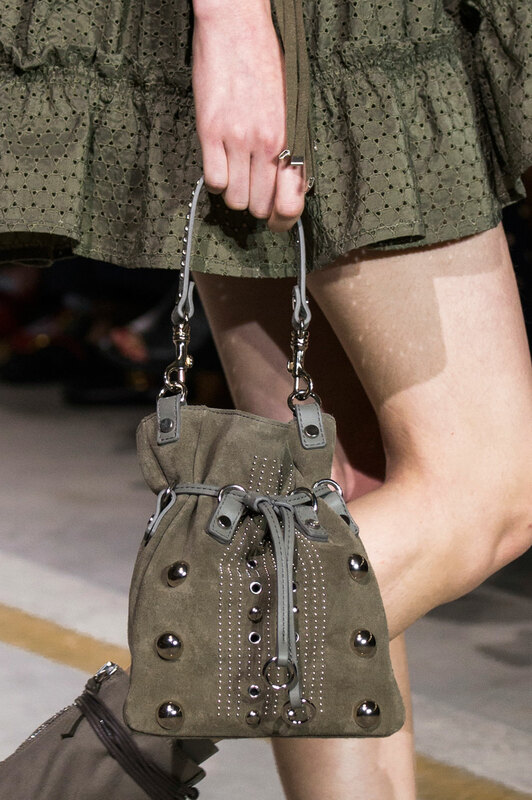 Sonia Rykiel offered a feminine toughness through an olive leather skirt, which was lent further definition through the large button detailing and slit design. 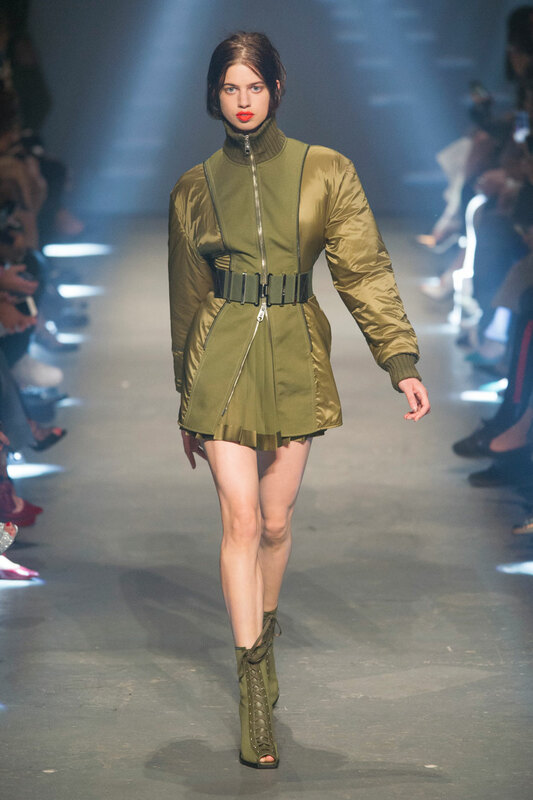 Swapping the battlefields for the streets in Versus’ take, where an urban edge was achieved through khaki bomber jackets accentuated by ribbed detailing, oversized collars and laced up boot combinations; staying true to its established rebellion. 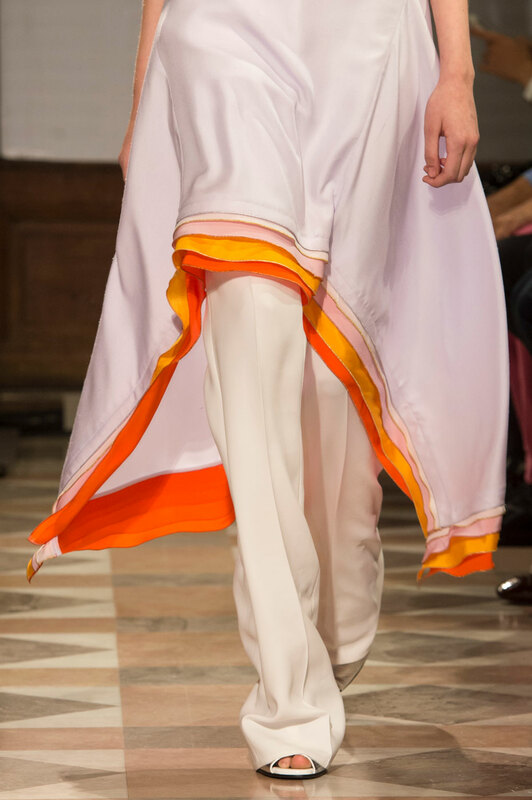 Perfect for the spring and summer months, a palazzo trouser was a firm favourite by many designers who sought to reimagine the likes of Hepburn and Garbo. 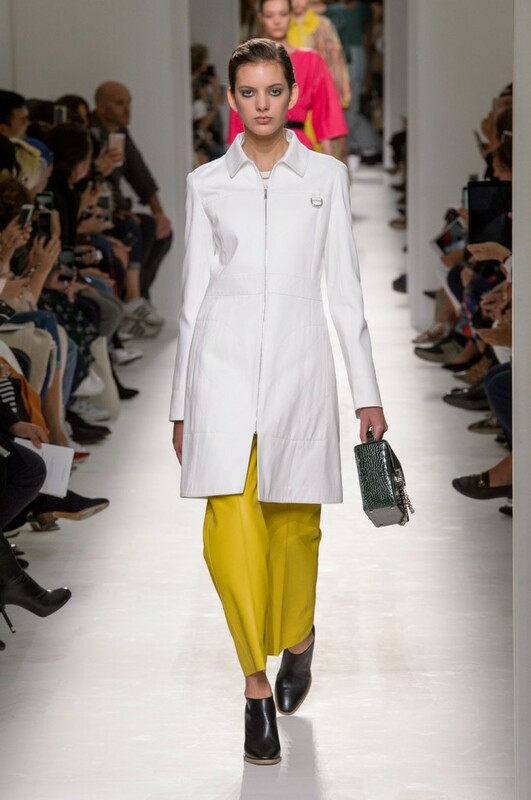 City chic was the advocated motif put forward by Ackermann, with streamline silhouettes matching with a white, drop-sleeved shirt to produce an effortless working day attire. 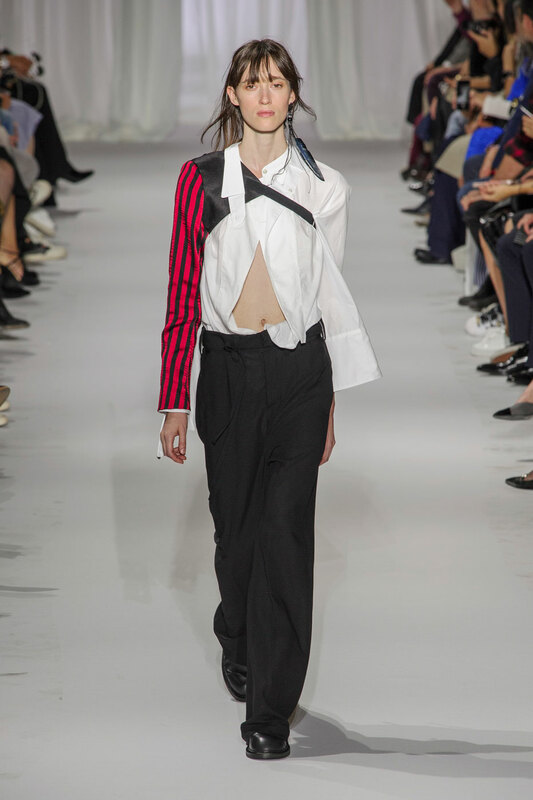 Agnes B on the other hand opted for a slouchier feel, reinforced by the pinstriped pattern. 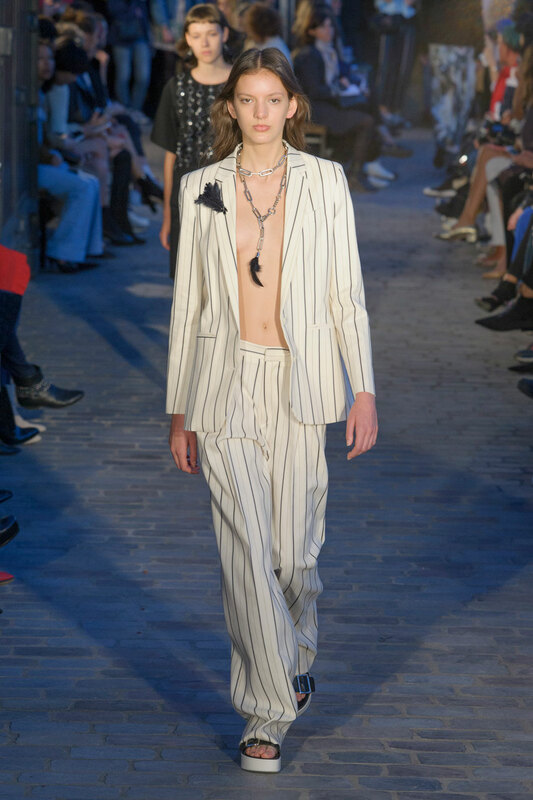 Blurring the lines between masculine and feminine, Ann Demeulemeester fused together the fluidity of palazzo trousers with strict, disassembled tailoring. 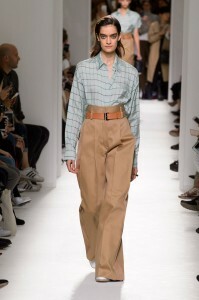 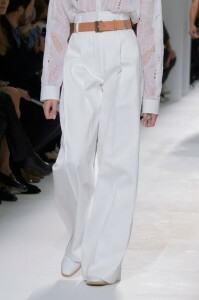 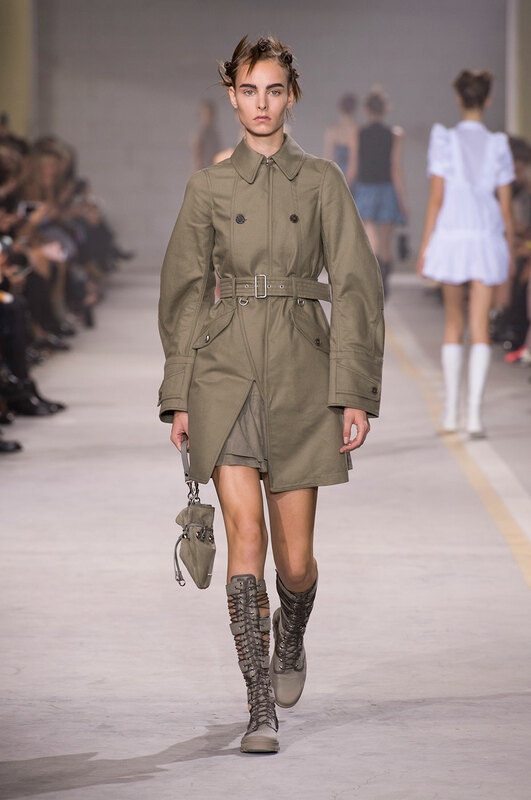 A structural silhouette was similarly seen at Hermes, where wide legs contrasted to high-waisted designs and transferred attention to this area through wide-bucketed belts, giving definition and an elongated frame. 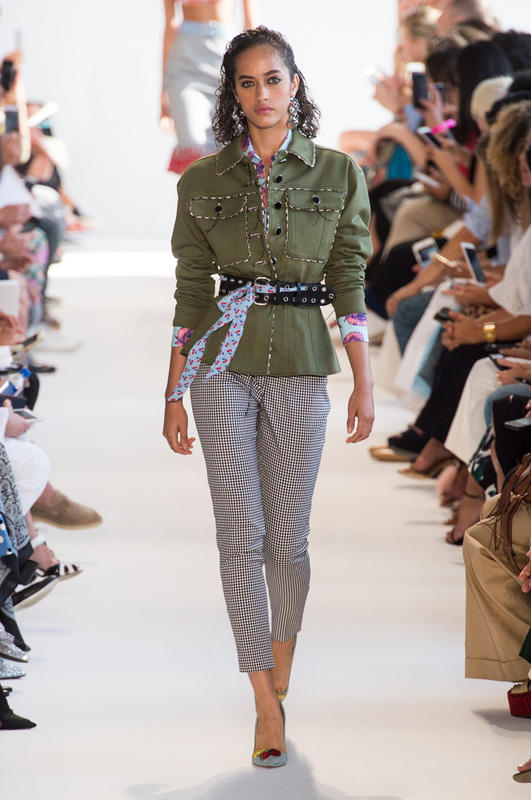 The palazzo trouser was used in conjunction with boxy jackets in Kenzo’s show; the rolled-up sleeves stressing the flare of the pant. 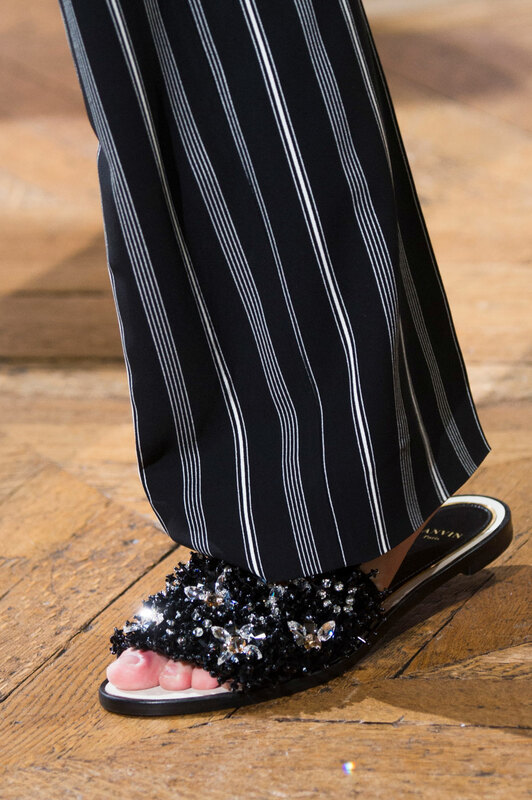 Lanvin focused on comfortable elegance through the studded sandals and overhanging jackets, both of which worked with the fluency achieved by the palazzo trouser. 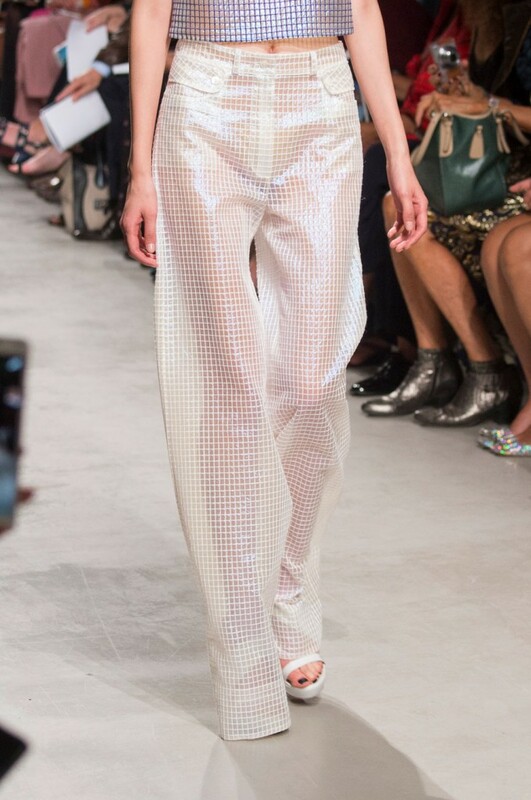 Slightly more industrial-feeling garments clung to the legs of Guy Laroche’s models; a grid-like pattern embellished a plasticky looking trouser that seemed to have a certain stiffness usually avoided by a palazzo trouser, Equally, metallic panelling gave a modernised decoration to an otherwise simplistic ensemble. 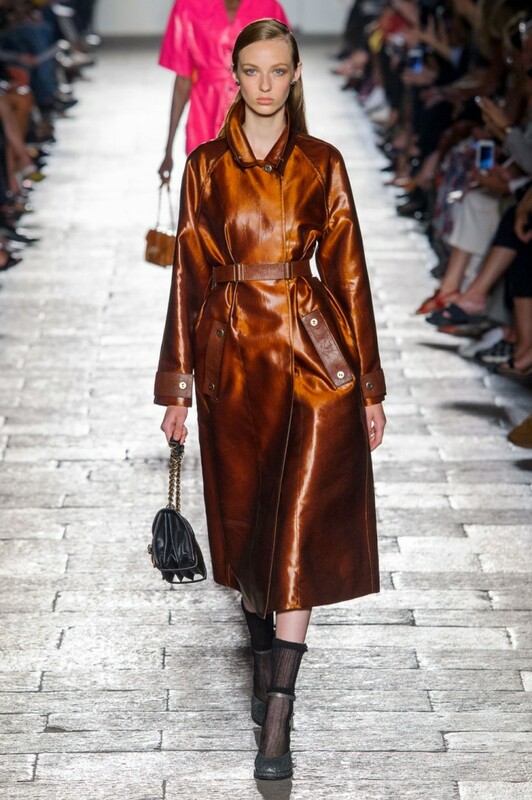 There was a sporty edge to the looks on show at Loewe in the form of a bold print of orange and black as well as loose-fitting and lightweight trousers with leather trim. 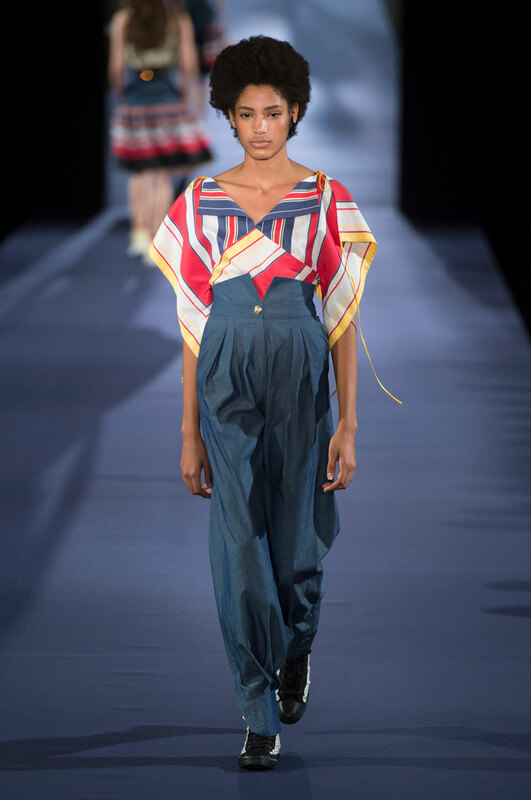 With a retro vibrance in the air, a fresh take on the palazzo trouser was seen at Alexis Mabille through the high waistline, front pleats and cuffed ankle, bolstered by the primary colours of blue and red. In keeping with their established futuristic sensibilities, Paco Rabanne’s minimalist trouser was elevated by the ultra-flared hem and matching hooded shirt. 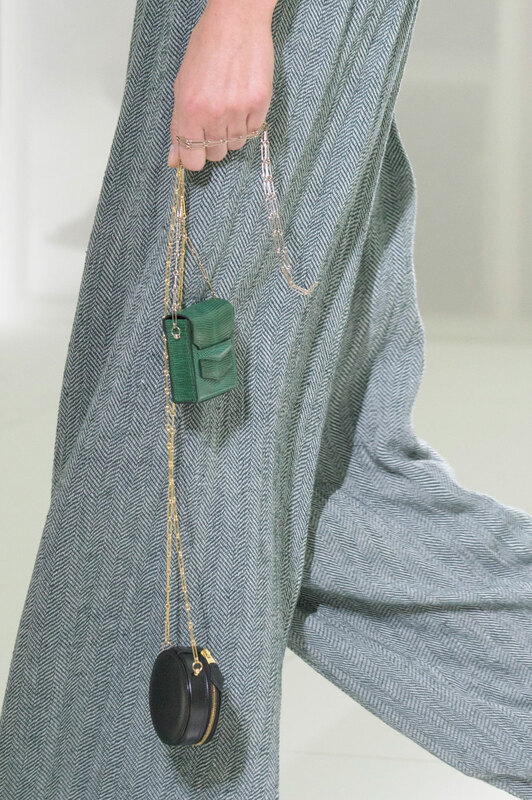 Urban and causal, low-rise pants were paired with boyish shirts, elongated straps and metallic-chained jewellery to categorise Paul and Joe’s take on the trend as adolescent and robust. 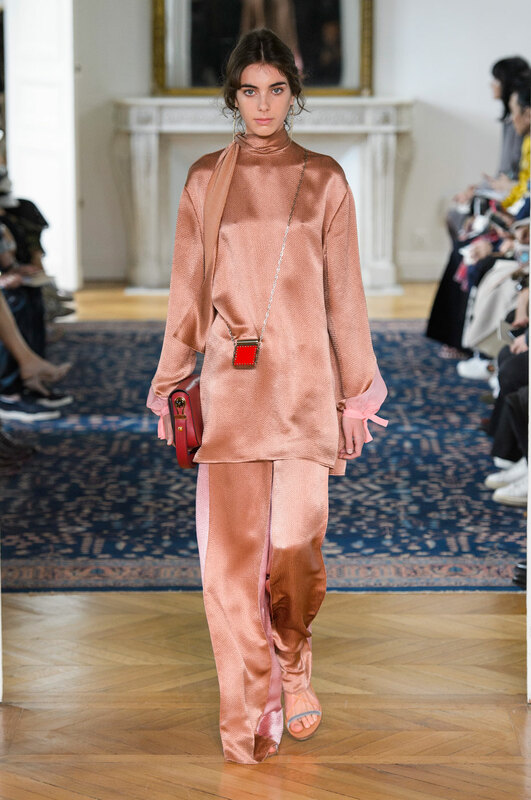 A soft shade varnished the trend at Valentino, with the baby-pink colour complimenting the delicate satin, both emphasizing wide-leg and flared hem. 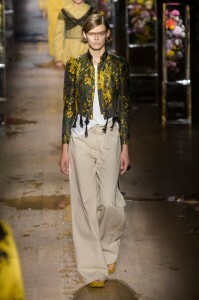 Dris Van Noten featured a palazzo trouser in a range of outfits, signalling its truly versatile functionality; from a loose aquatic print, to a heavier denim fabric and slightly peplum style, Van Noten’s manipulation heralds the palazzo form as both refined and easy-going. 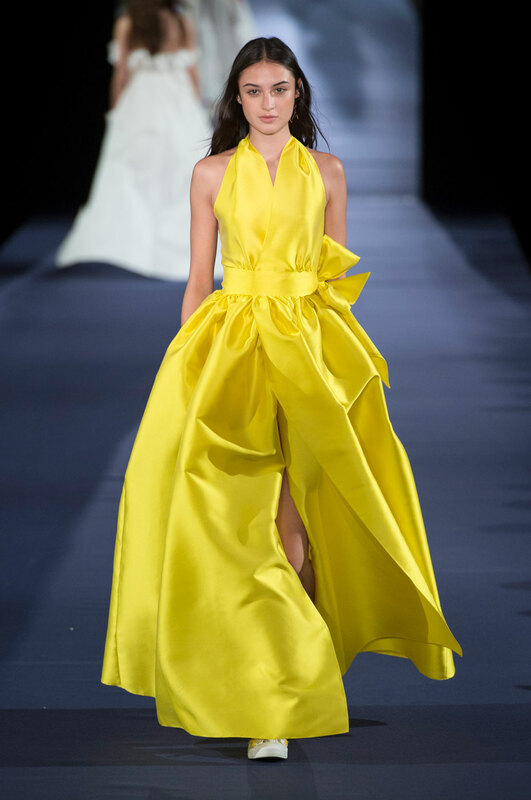 Vionnet similarly used the palazzo in two contrasting styles; the first incorporated floaty fabric to produce an airy and lightweight design, whereas the second featured a more weighted fabric, with the opaque colour complimenting this density. 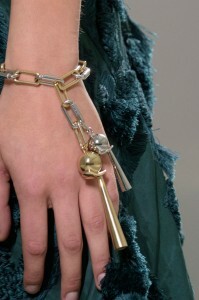 Designers invested in imaginative constructions where ingenuity and uniqueness thrived. 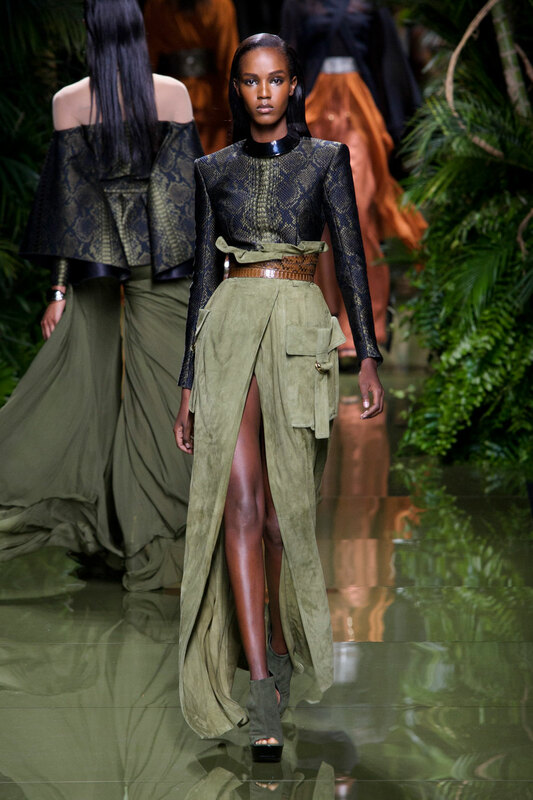 Balmain’s offering gave prominence to thick, open-toed wedges in colours ranging from a deep olive green to a diverse display of animal print. 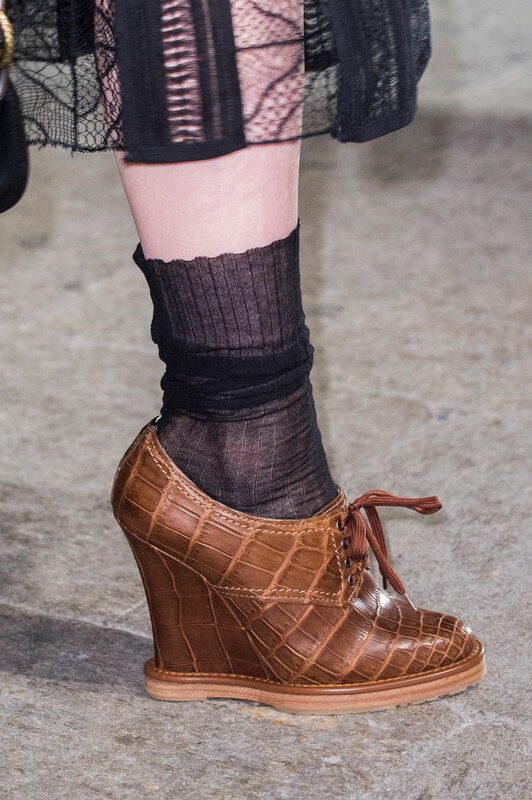 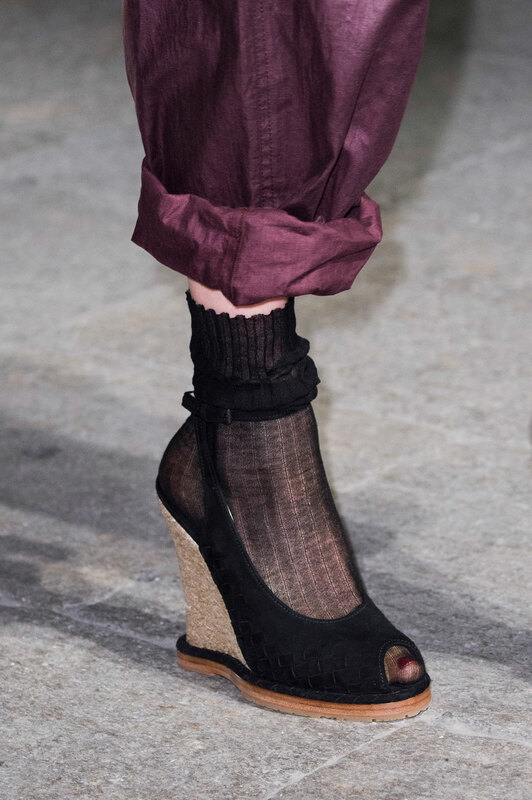 A forties inspiration was evident in the Bottega Veneta show, where wedge hells were updated through glossy leather finishes and suede yute compositions. 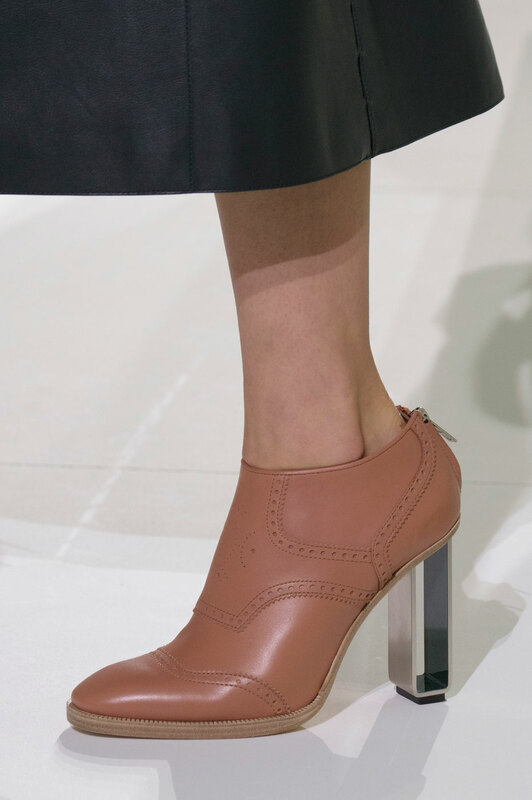 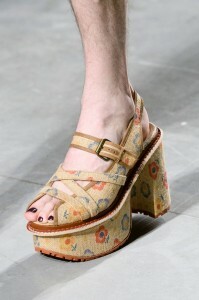 A slim ankle strap accompanied most looks and if absent, a two-tone, almost brogue design was put in its place. 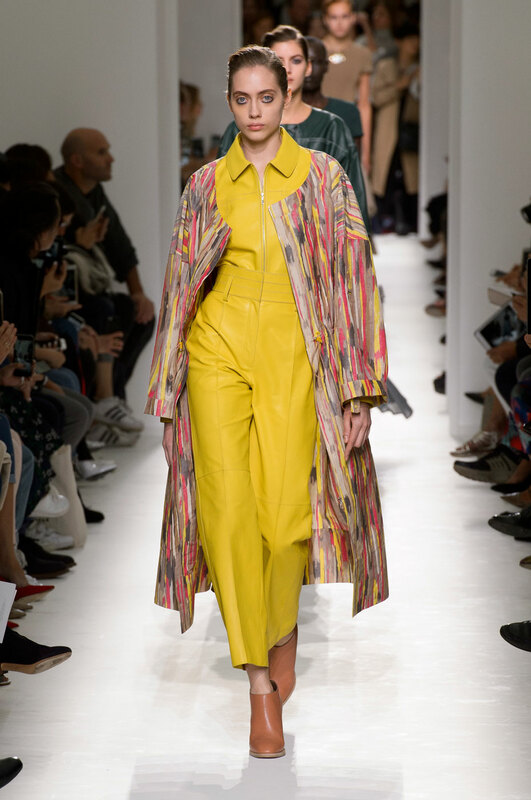 Issey Miyake mastered the fine art of making the kooky look exquisitely desirable through a quirky yet minimalist sensibility; channeling a Japanese influence, rectangular structures were coloured in vibrant hues with the combination of wood and leather creating an impeccable uniqueness. 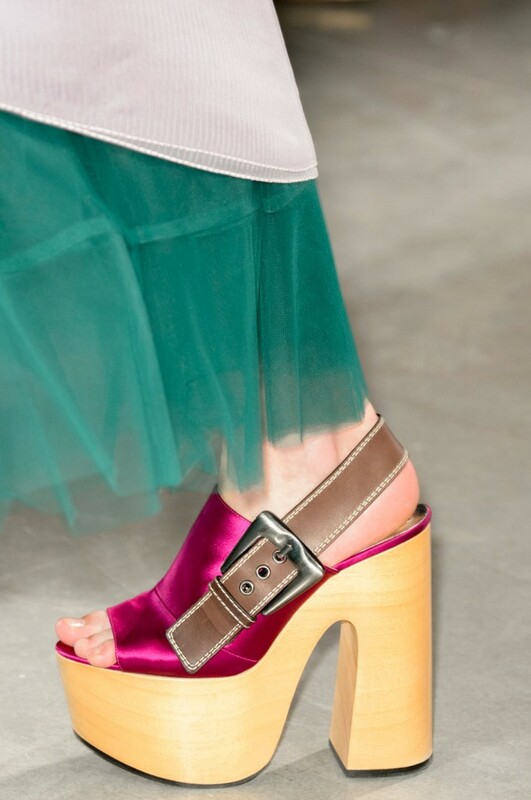 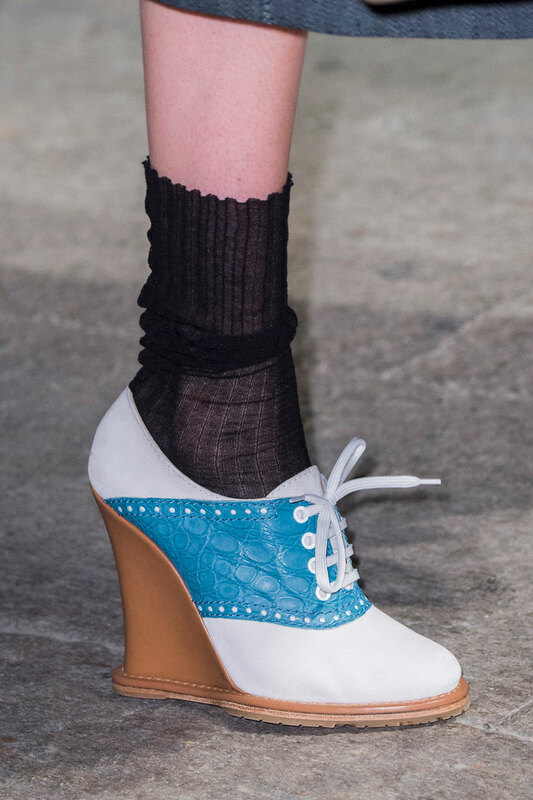 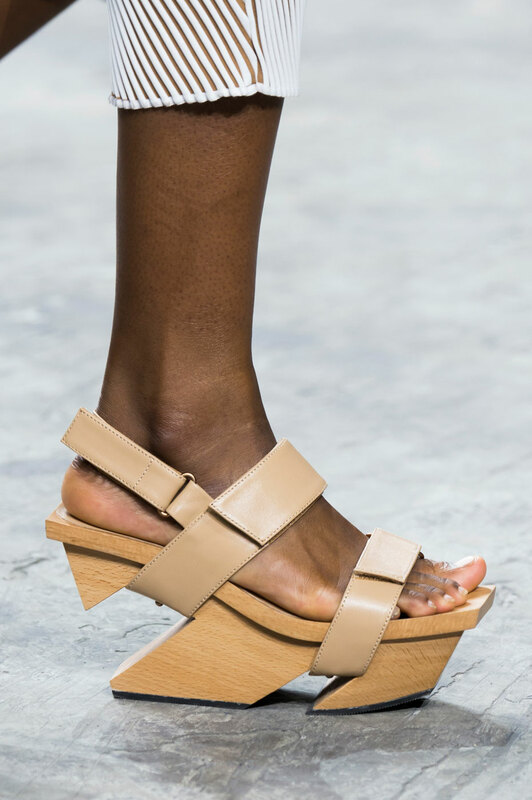 There was a mix of wooden soles and colourful shades also seen in Rochas show, with the platform wedge emphasising the slingback form and giving definition to the fuchsia and bright blue colouring. 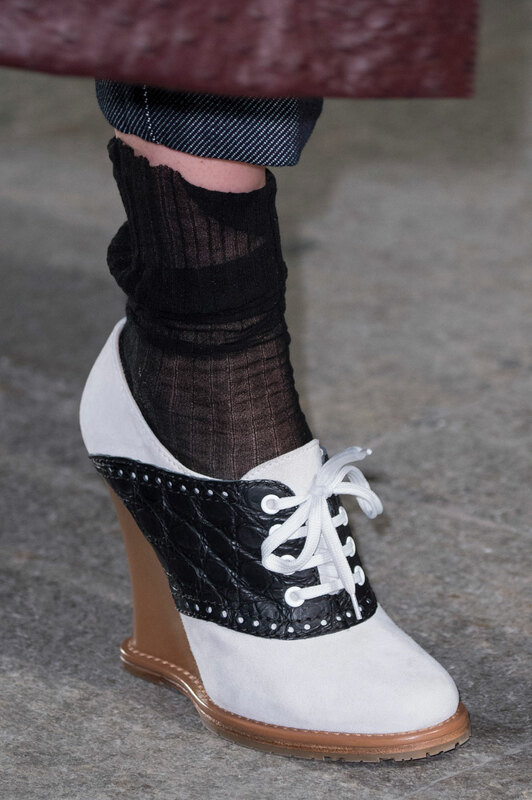 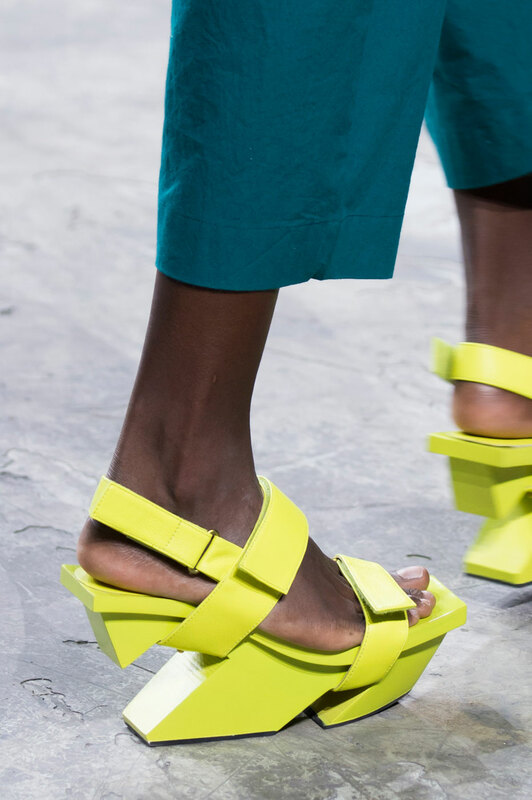 Chunky soles were transformed in Proenza Schouler’s collection through a playful splattering of colour; otherwise basic and dark shoes were enhanced by coloured lining, checkered patterns and spliced straps. Known for all things dramatic, there was a rather understated elegance to the shoes that graced the Vivienne Westwood runway, with a floral platform being paired with a criss-cross strap providing a vintage feel, while a studded clog with gold detailing maintained the muted ambience. 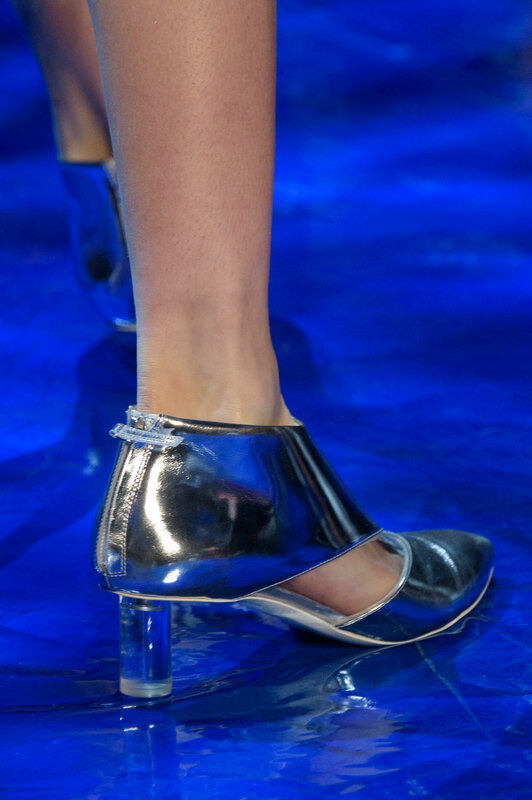 This season’s glass heel shatters expectations by refashioning classic looks with a dynamic twist. 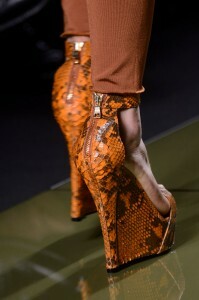 Balmain showcased open-toed designs which were tinged with coloured glass to create towering wedges. 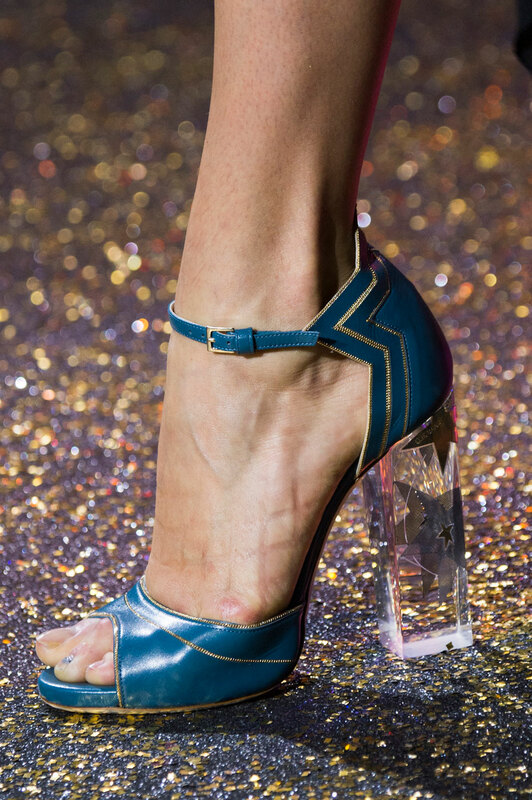 Majestic heels were seen at Elie Saab, were thinly-strapped shoes were trimmed with gold thread complimenting the shimmering star design imprinted onto the heel itself. 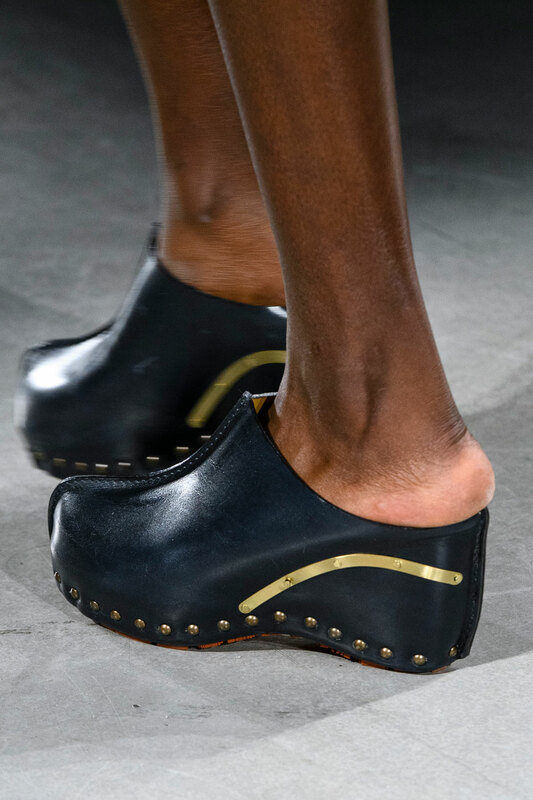 Dated, almost 1960s designs were given a modern overhaul through open-spaced heels, with the margin and thick soles giving an architectural feel. 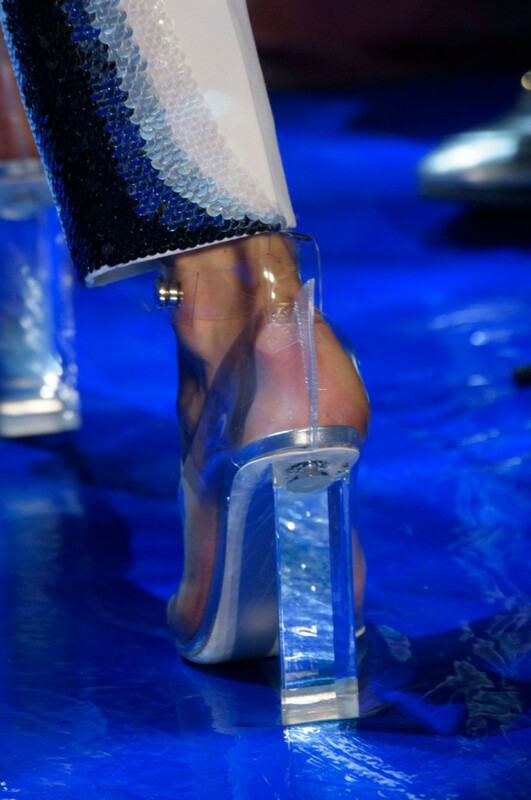 A range of heels were offered by Mugler, with mini metallic kitten heels as well as chunkier, transparent numbers making an appearance. 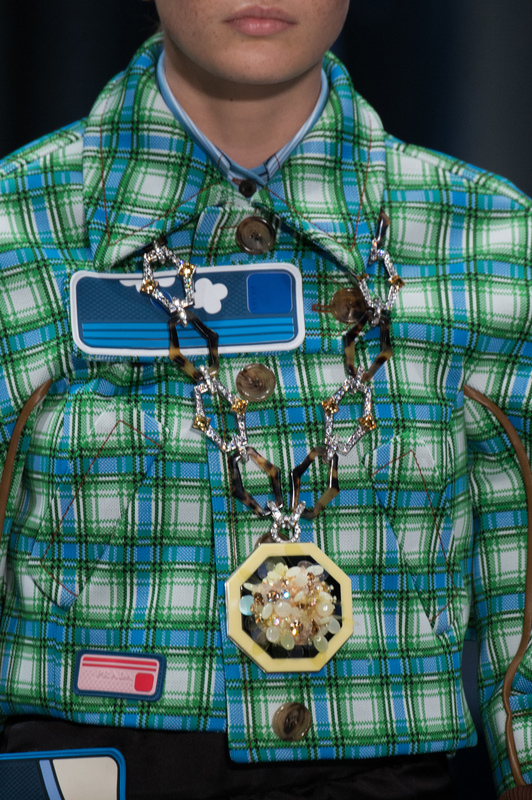 Honing in on the transformative powers a standout piece of jewellery holds, chunky adornments inflated many SS17 looks this season. 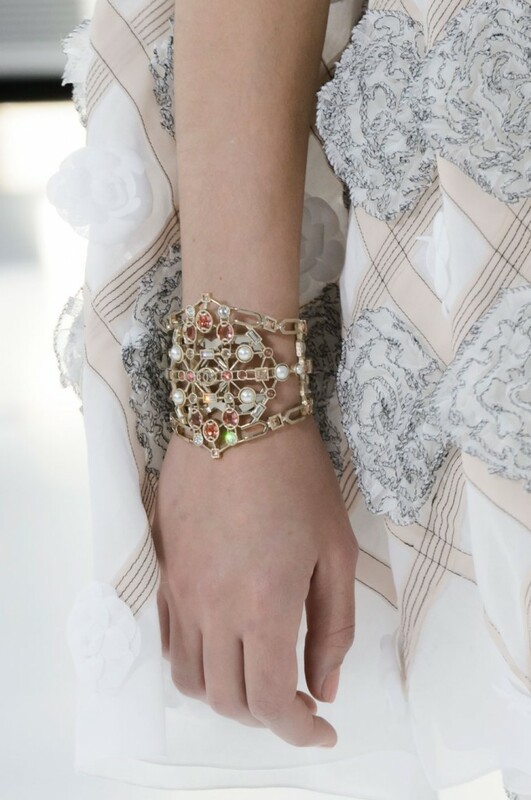 Elegant designs filled Chanel’s show with intricate conceptions of multi-coloured oval gems interlocked through thin, golden chains. 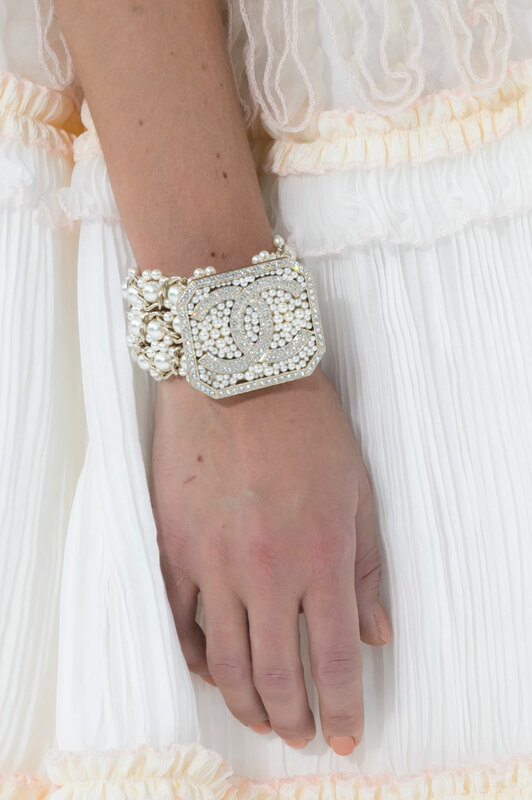 A mixture of beads formed the backdrop onto which the signature Chanel emblem was carved from glittering jewels. 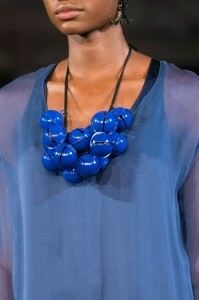 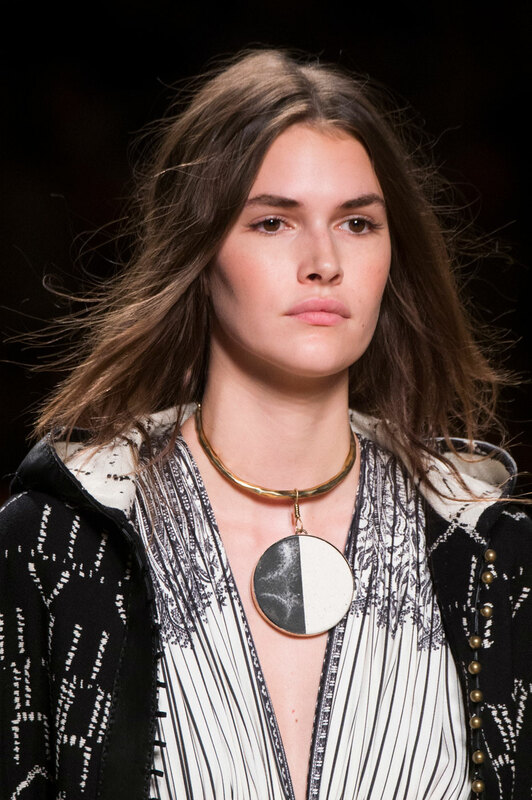 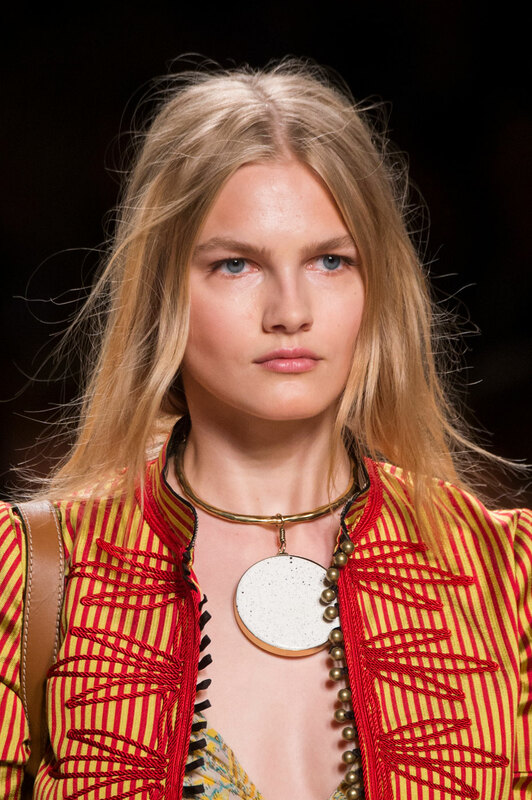 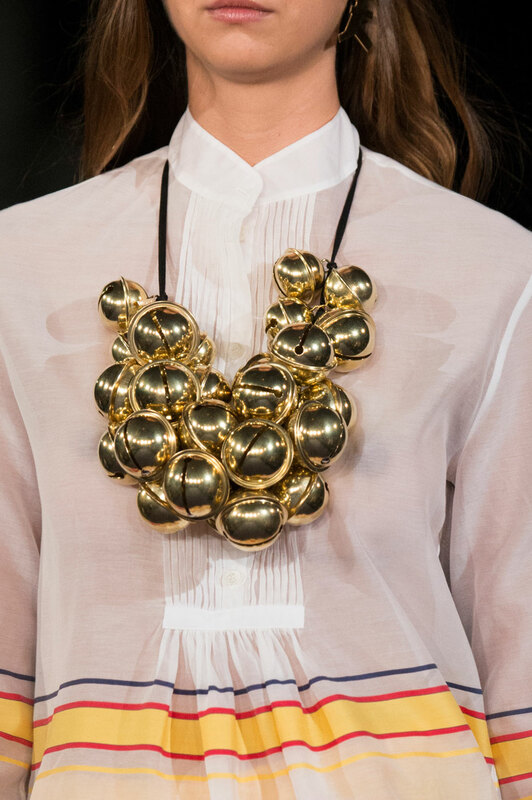 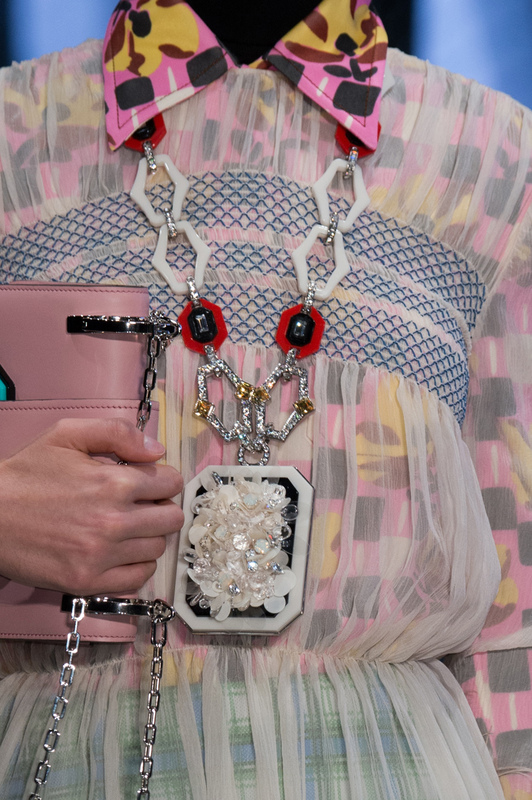 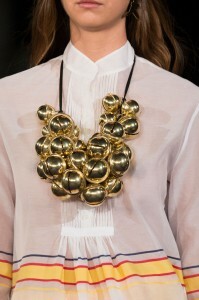 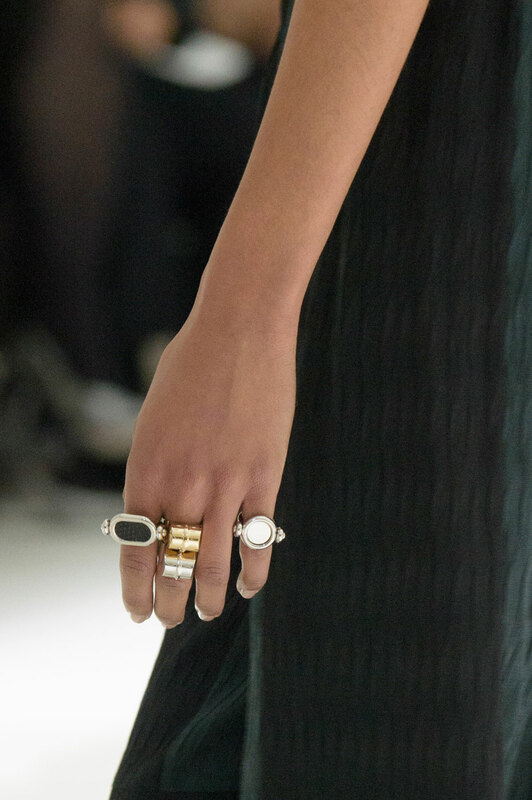 Monotone jewellery was boasted by Etro in the form of oversized and circular pendants hooked onto stiff, golden bands. 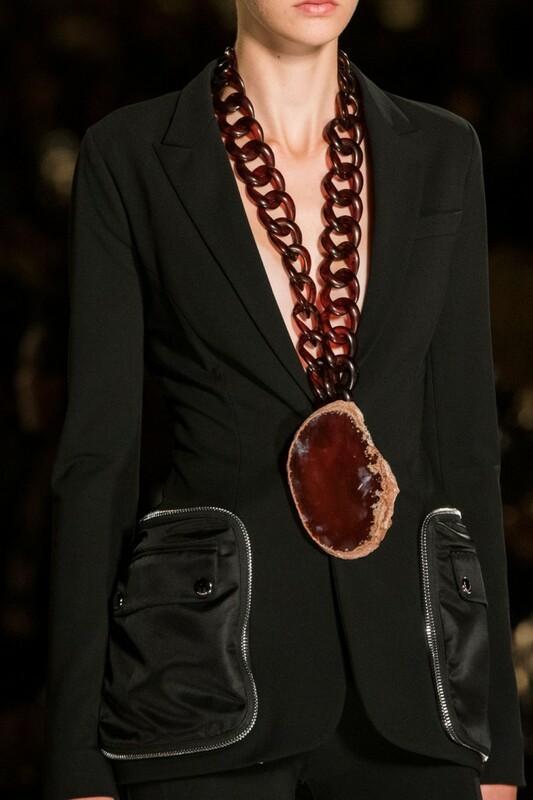 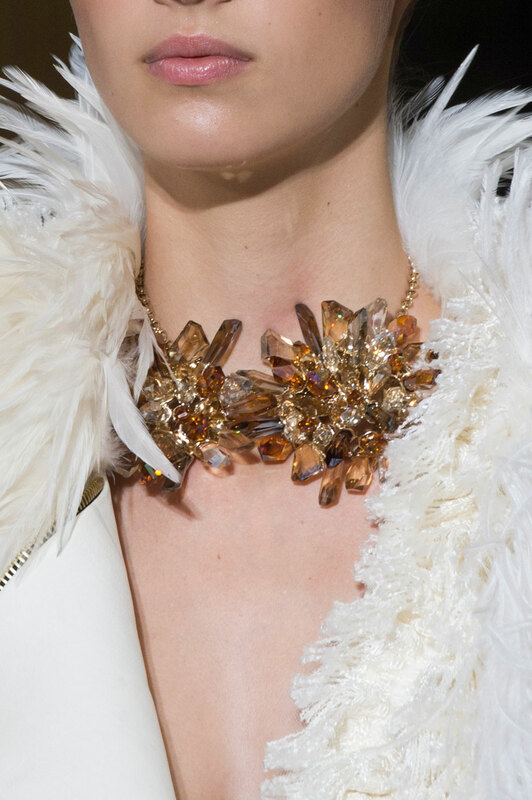 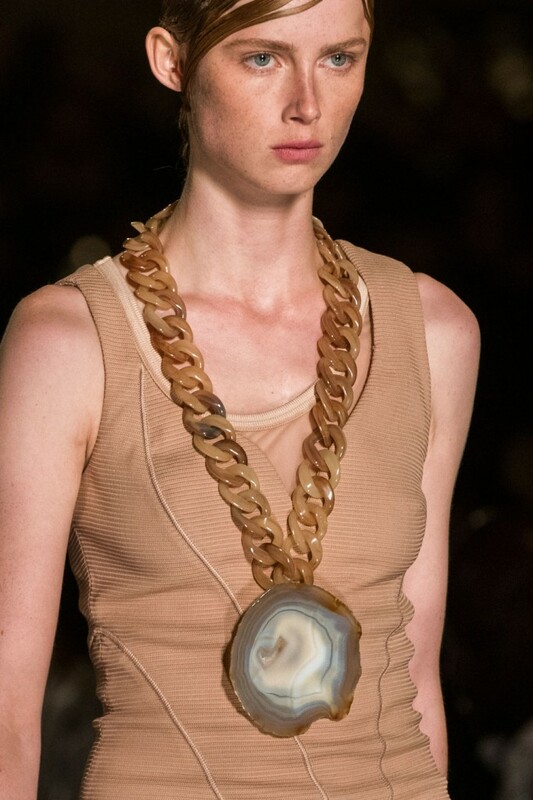 Huge agate necklaces were a firm feature in Givenchy’s collection, with Riccardo Tisci combining the large crystallised designs with chunky curb chains to create a modern and earthly feel. 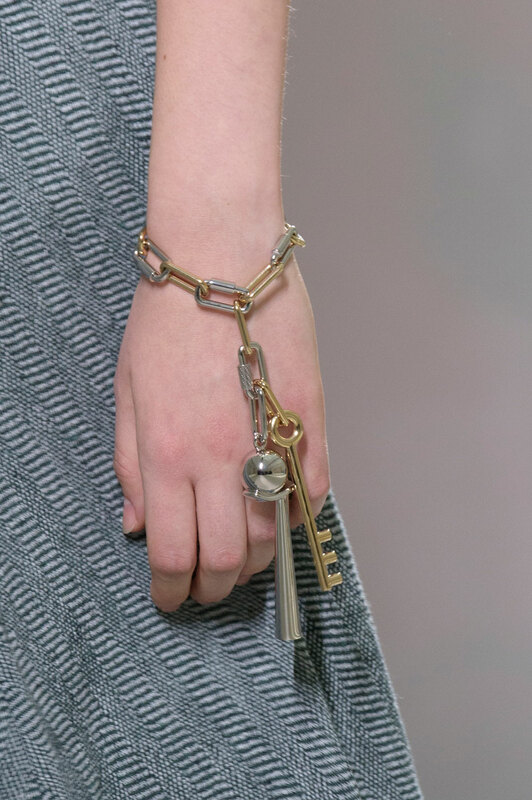 Key, locks and hooks made up the jewellery on show by Hermes, featuring an assortment of gold and silver pieces which all interlocked and dangled elegantly over the hands. 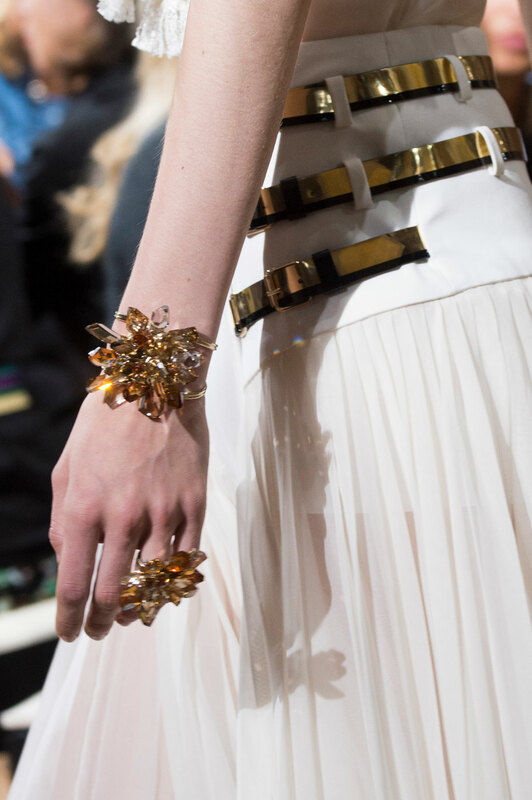 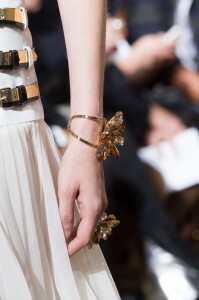 Gold-tone detailing was incorporated into exaggerated designs by Lanvin; a diverse range which achieved intensity through the fiery, almost floral bracelets, a mismatch of golden and copper hues, and sophisticated chainmail chokers. 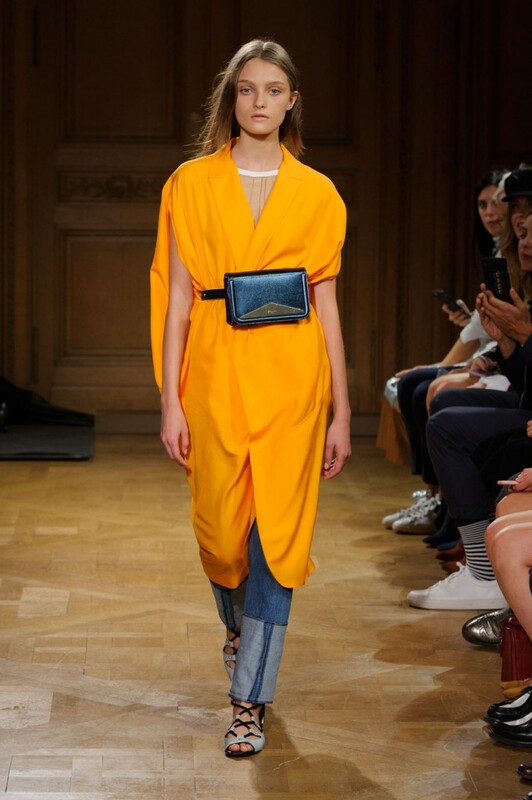 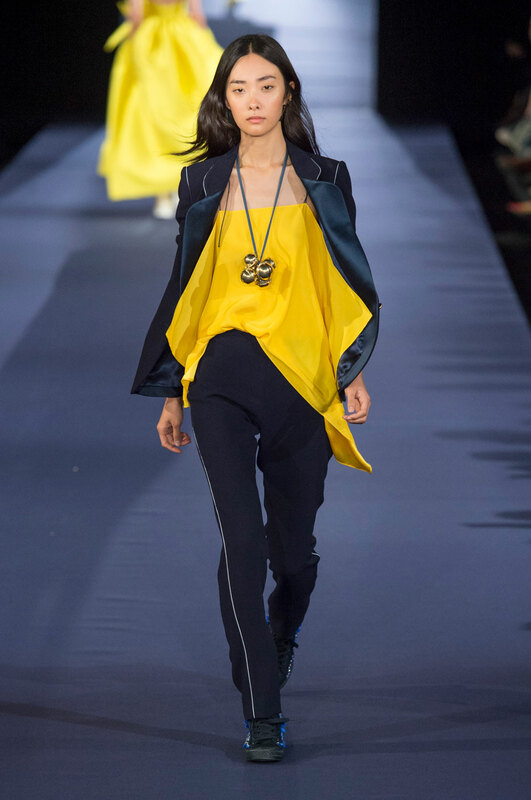 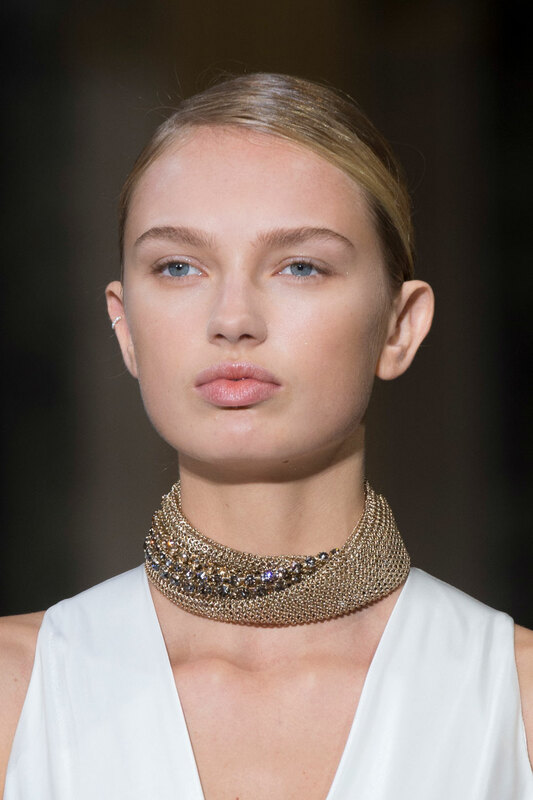 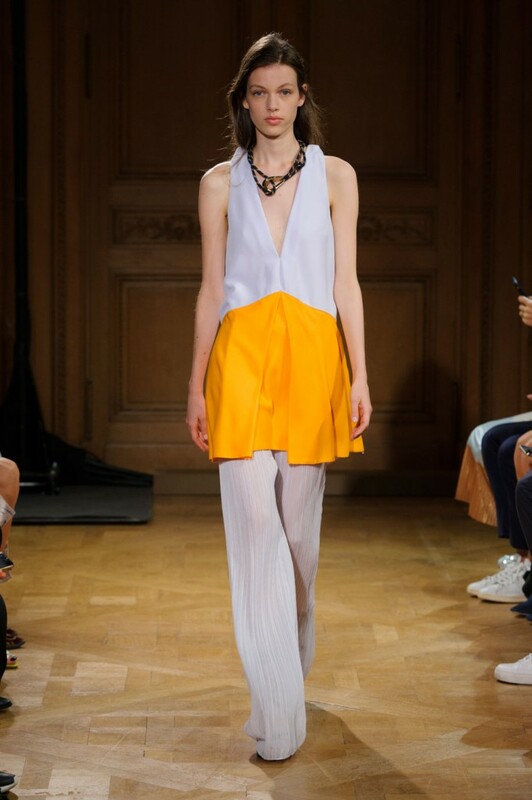 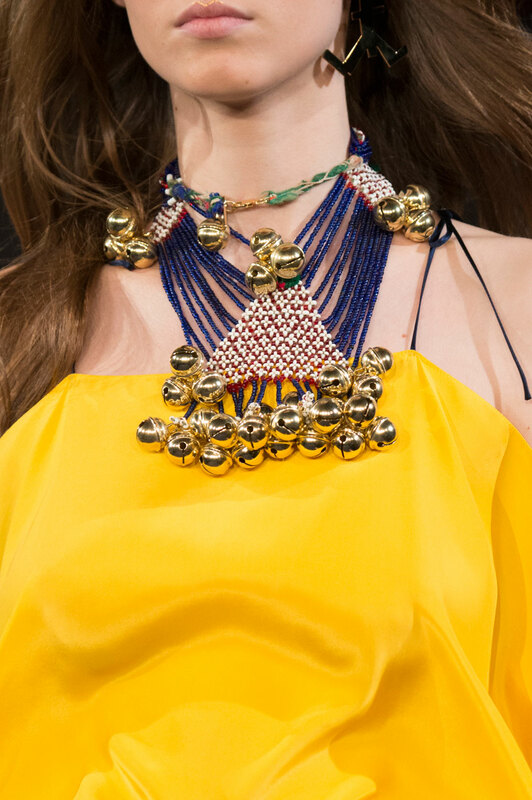 Necklaces loaded with bauble-sized bells stood out at Alexis Mabille; large clusters dangled from a thin fabric necklace with colours ranging from a golden finish to an electric blue. 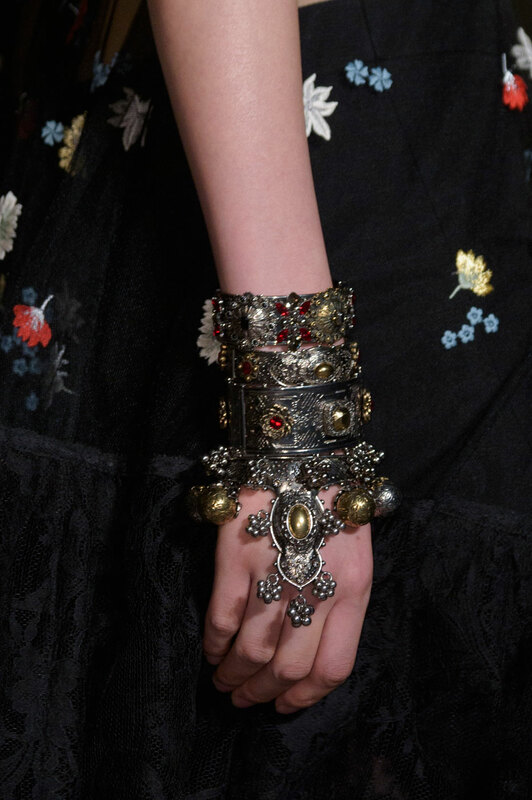 Gothic glamour was displayed by Alexander McQueen, perfectly capturing the dark decadence that the label is famed for, yet fusing this with a regal elegance through the deep-red gems and silver-tone structure. Subtle would not be an appropriate description for the jewellery on offer by Phillip Plein; the extravaganza featured excessive amounts of gold, with most pieces layered and hung in a medley of ways and all tangled together to create an explosion of modern glitz. 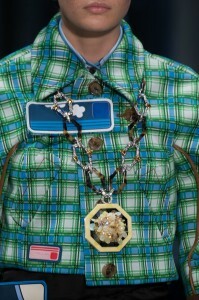 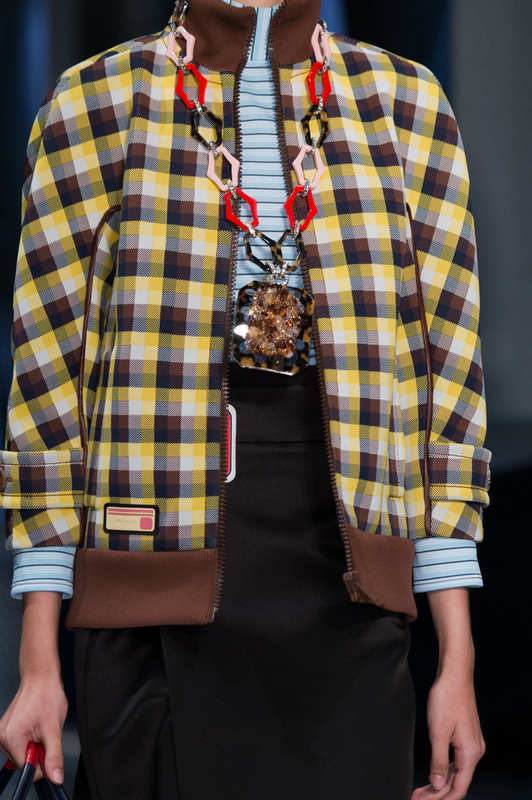 Geometric designs filled the Prada runway, with necklaces shaped from octagonal pedants suspended from smaller, interconnected hexagonal structures. 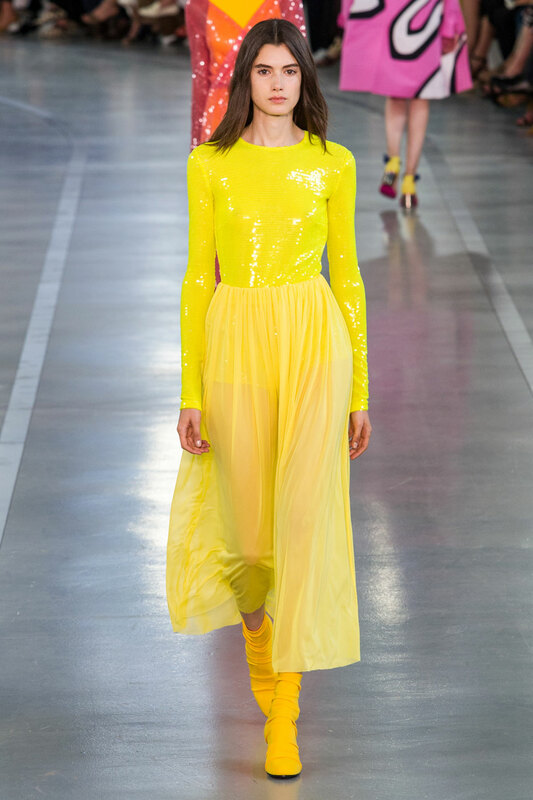 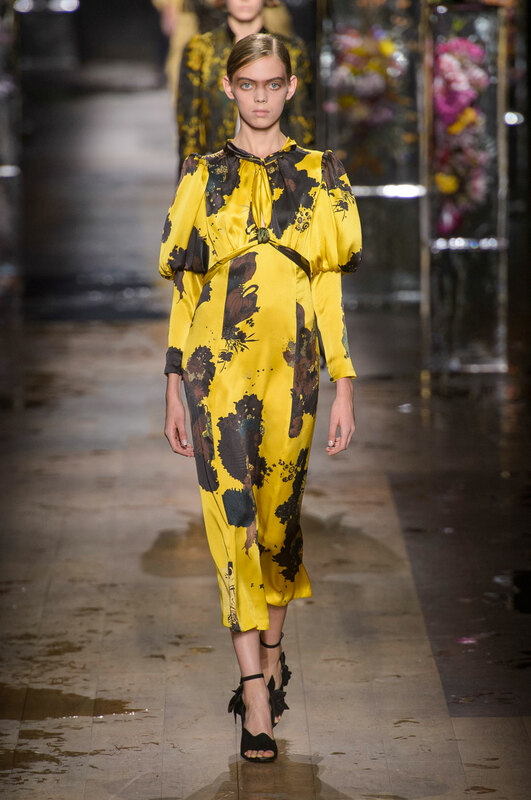 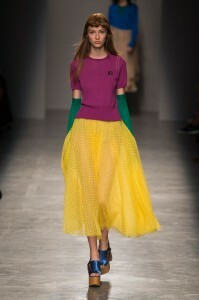 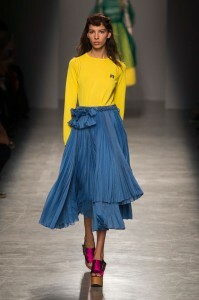 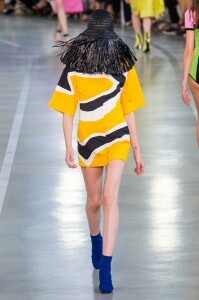 Designers imbued many looks with a pop of colour through their adherence to chromatic shades of yellow. 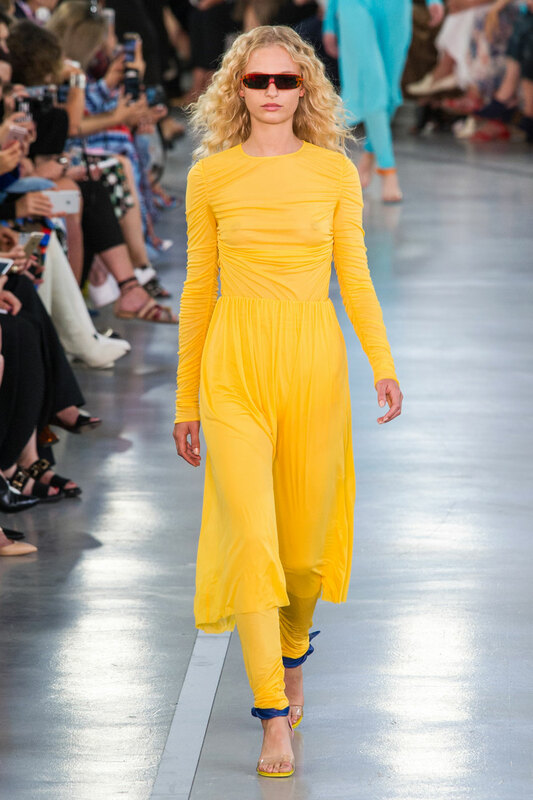 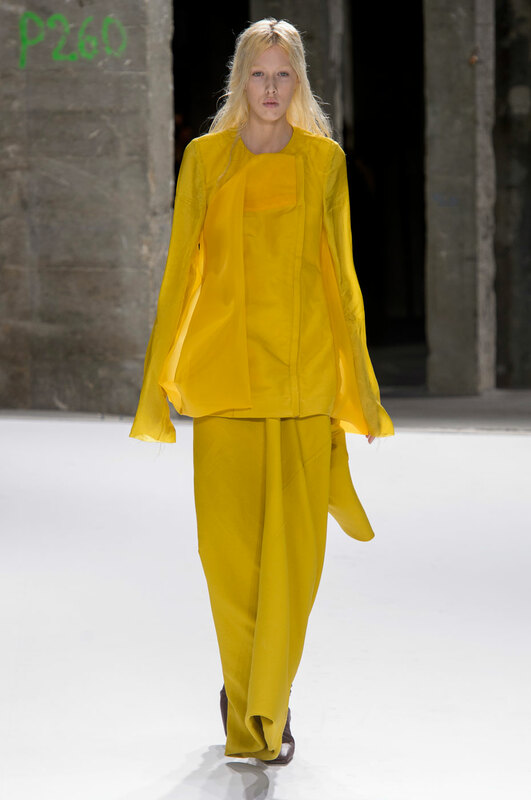 Demonstrating its versatility, an electric yellow was championed in a number of Ackermann pieces; from a greenish-yellow slim dress to a flowing and plunging chiffon outfit, the colour gave looks a magnetic edge. 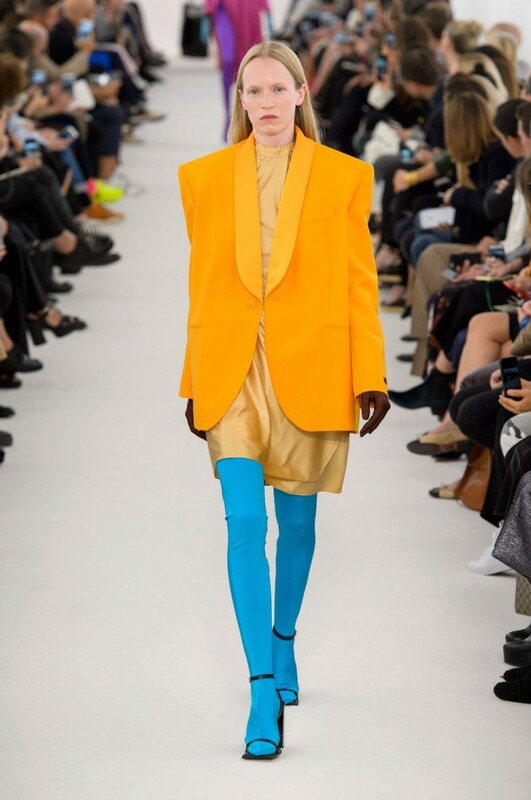 Bulky designs were relaxed and softened through the marigold tones which sharply contrasted the bold primary colours assigned to the lower garments. 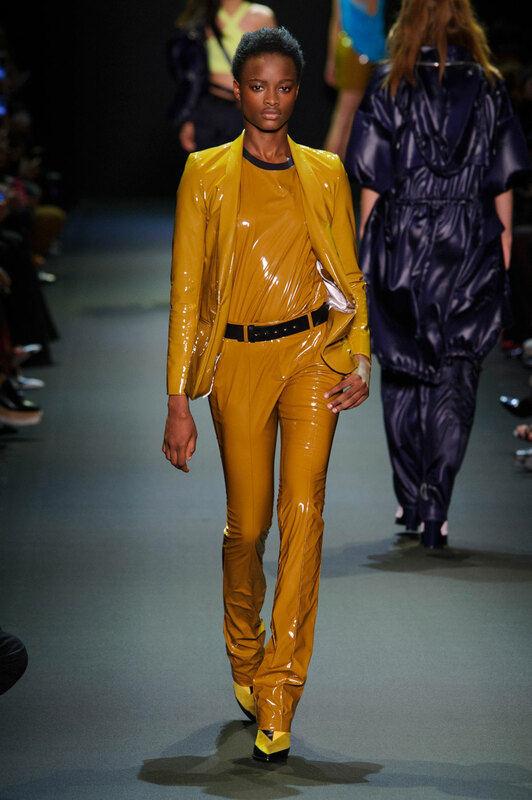 PVC outfits were adorned with butterscotch tones, the contrasting yellow and black colours amplifying the tight-fitting clothes. 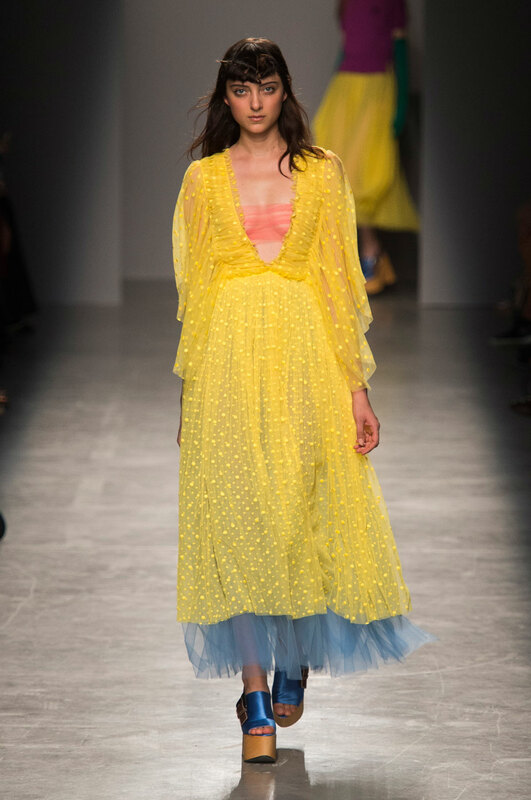 A light yellow offered a demure feel to Veneta’s designs, with the pale colour complimenting the floral patterns and giving a softer feel to boxy, more masculine structures. 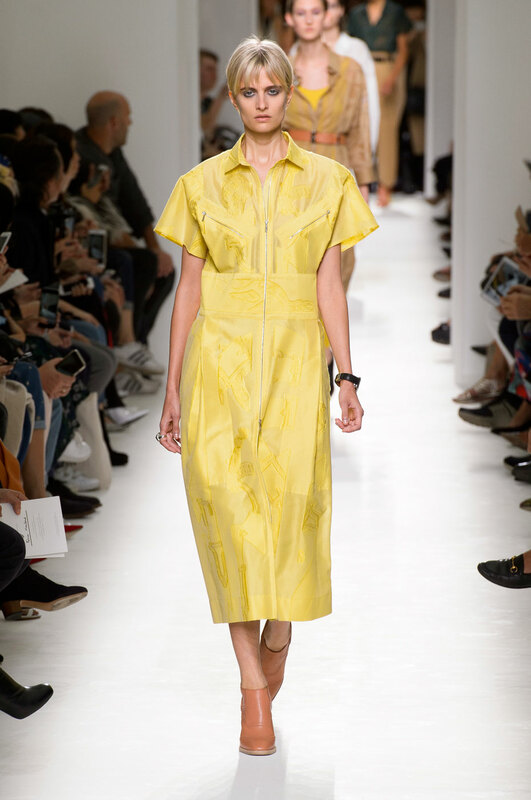 The vanilla-yellow shade used by Channel perfectly demonstrated how delicate colours can subdue more masculine silhouettes. 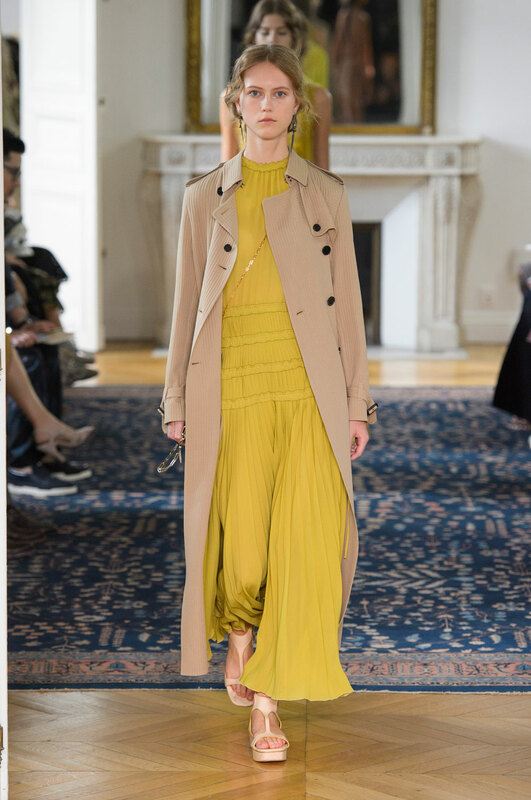 Tight pleats, ruffled skirts and layered sleeves were perfectly harmonised through the deep yellow colour, with the richness offering an air of antiquity and bringing life to the intricate detailing. 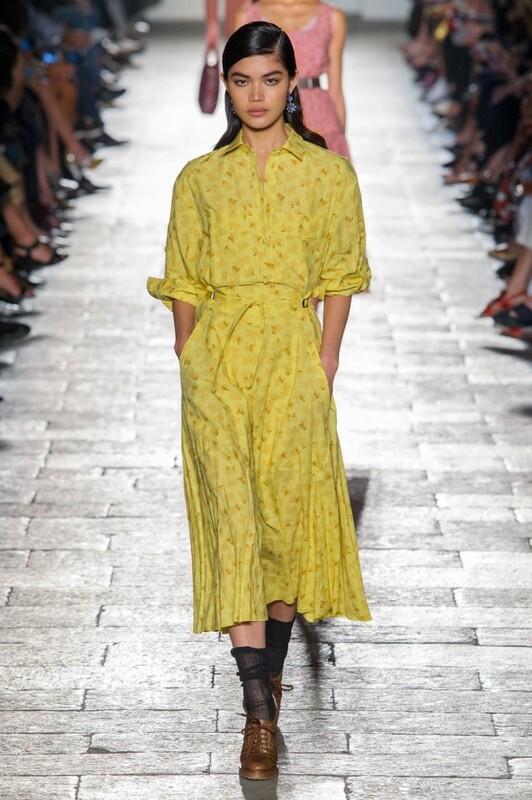 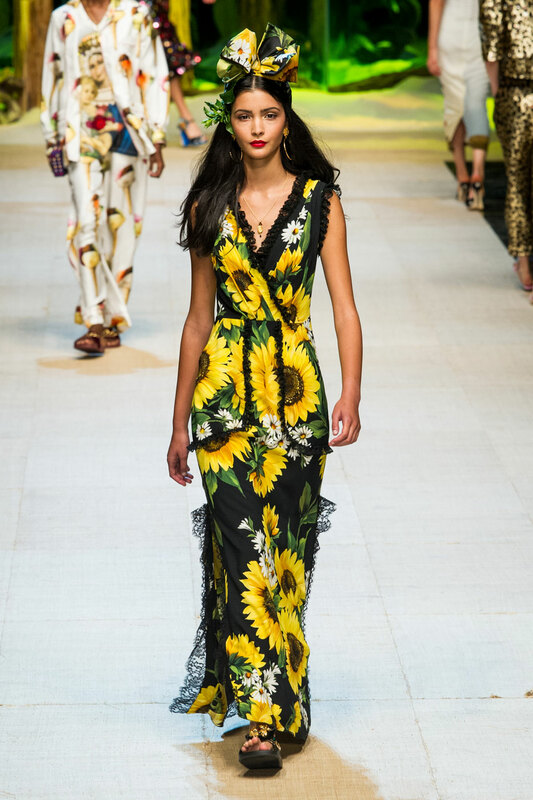 Combining the relaxed floral prints of sunflower dresses with more sophisticated ensembles of lace trims and three-quarter length sleeves, Dolce & Gabbana achieved an effortless maturity that stayed true to a youthful fullness throughout. 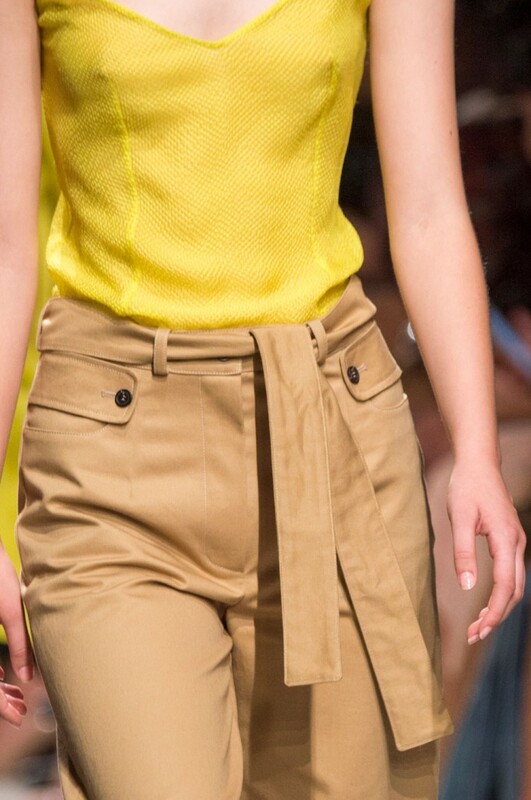 A bold and bright yellow elevated simple structures by giving them an ambitious vibrancy in Ferragamo. The use of a golden-yellow shade gave depth and intensity to a see-through dress with extravagant ruffled detail, the colour adding a slightly other-worldly feel. 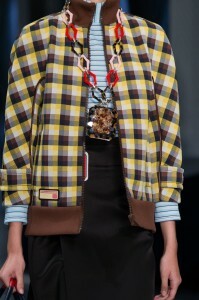 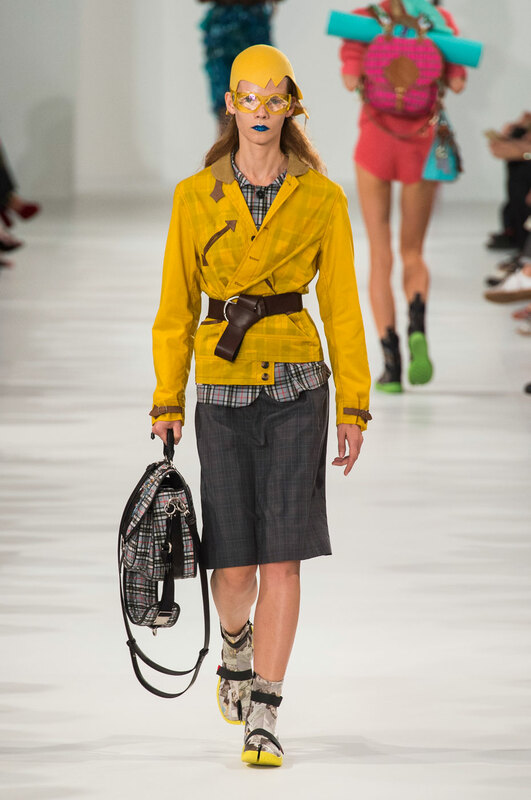 Hermes featured a mixture of yellow and greens, providing a sharp contrast to the neutrality of white outerwear. 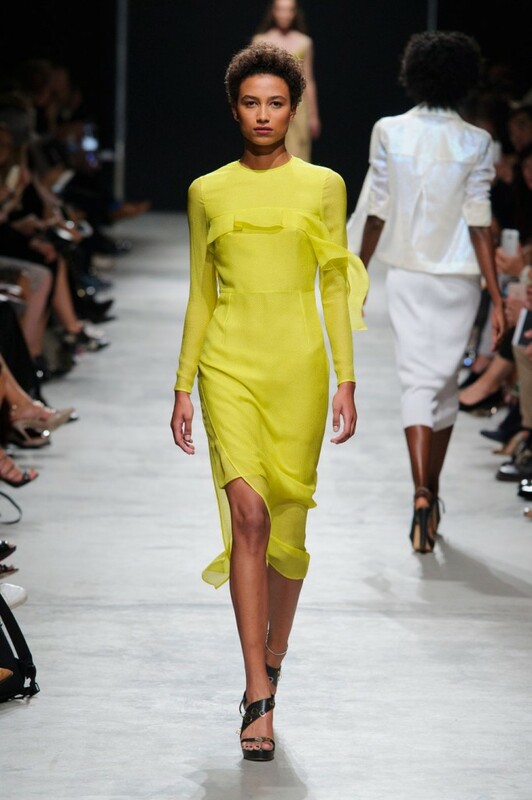 A more relaxed take on the trend was seen at Guy Laroche, whose pale yellows gave a lightweight feel to chiffon and sheer fabrics. 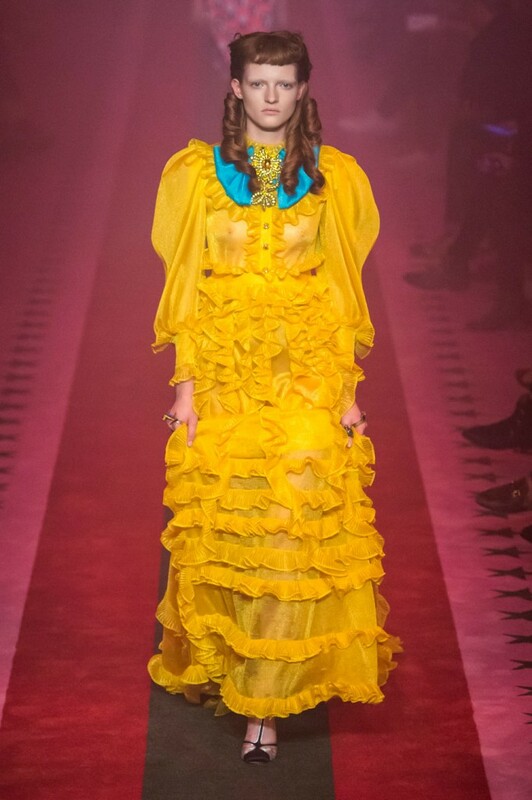 The vast display of canary yellow and rich mustards emphasised the standout pieces at Mabille, drawing attention to the golden tassels which formed the reverse side of several panelled skirts and fluorescent bustier dress. 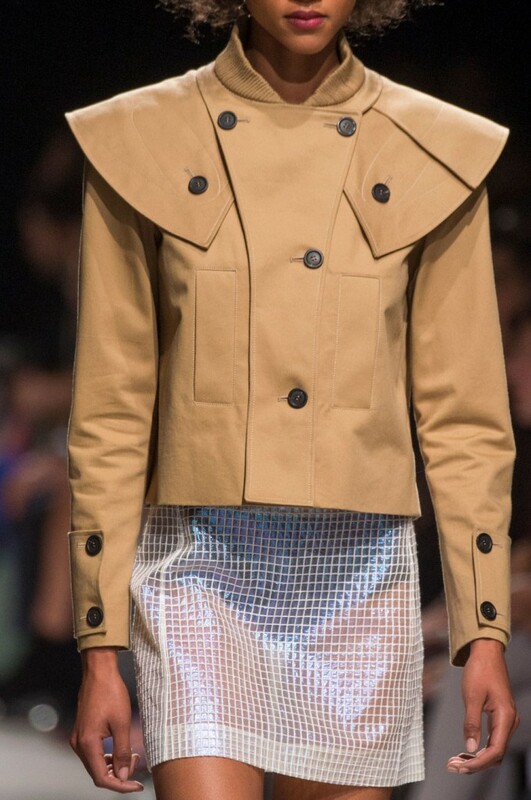 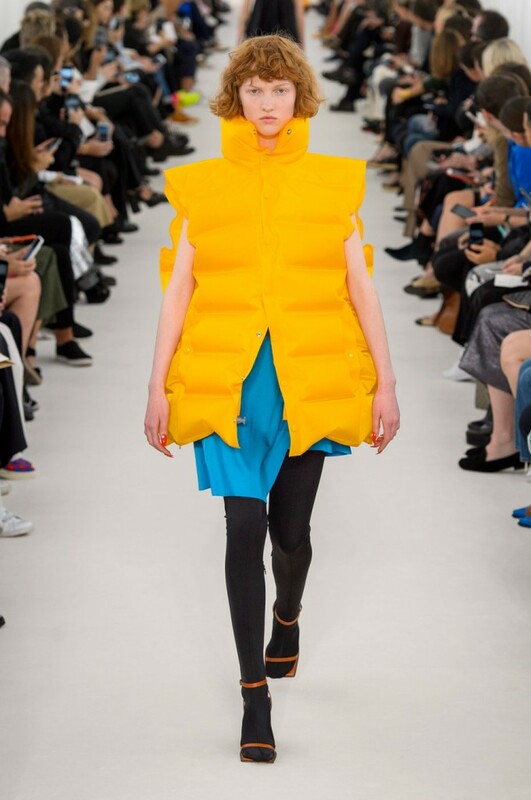 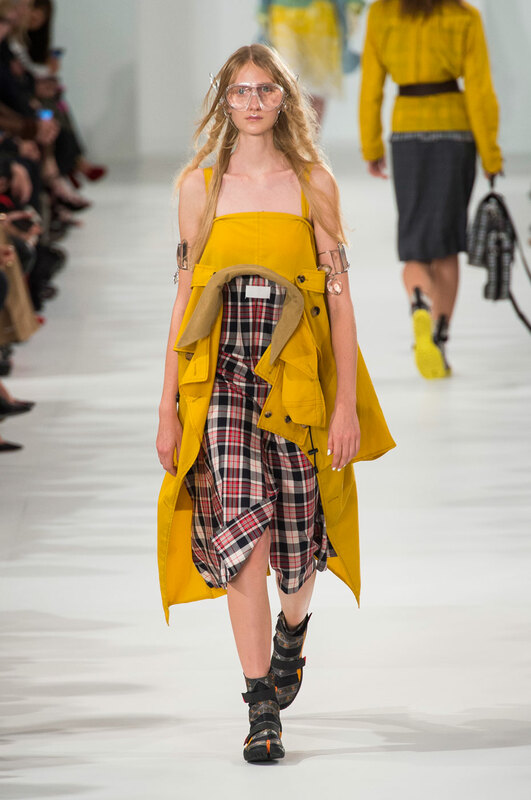 Honey tones graced the wacky designs of Maison Margiela in form of upside down and inside out coats, chunky belts and asymmetrical jackets. 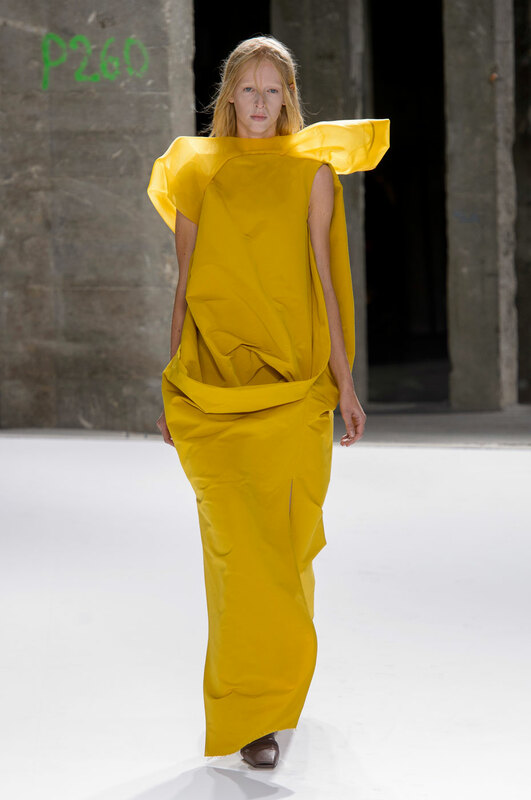 Theatricality was the emanating motif seen in Owen’s trend approach, with block yellow colours constructing the overhanging and distended designs whilst also demanding attention by hiding the figure through an assortment of textured layers. 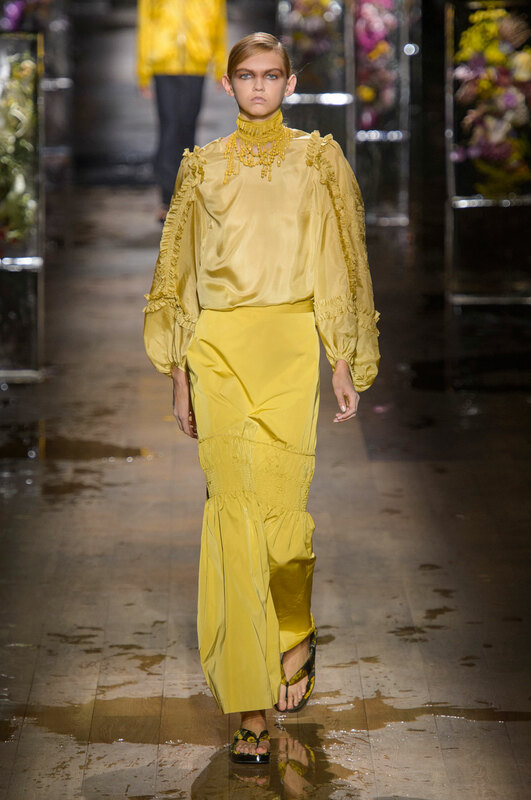 Acid yellow enriched soft designs of draped shoulders, chiffon, body-hugging dresses and sequin detailing to capture femininity at its most exquisite. 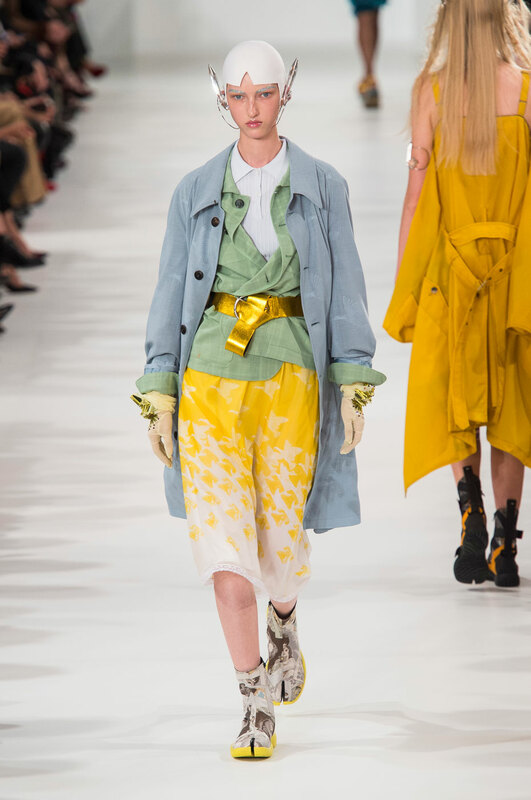 The colour combinations at Rochas produced an almost fantastical theme, with marigold and dandelion shades being layered on top of baby pink and light azure tulle. 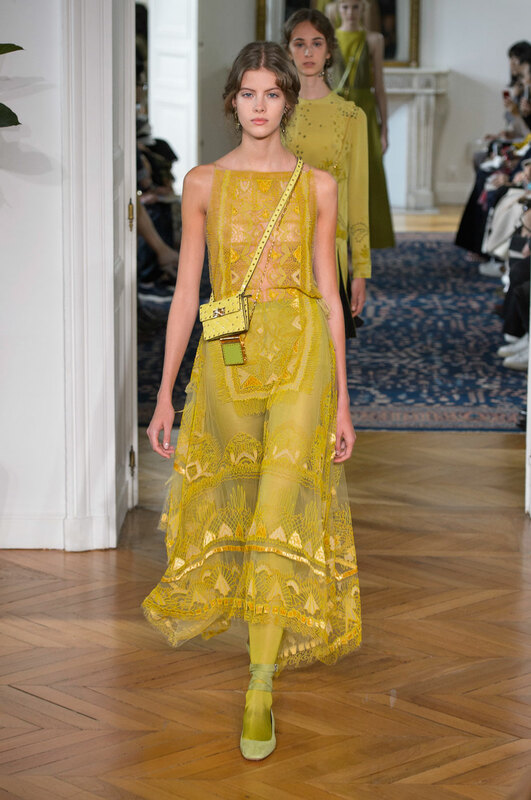 With a more bohemian take on the trend, Valentino featured hand-drawn prints, intricate embroidery and subtle pleats; all of which were illuminated by the flax yellow colour. 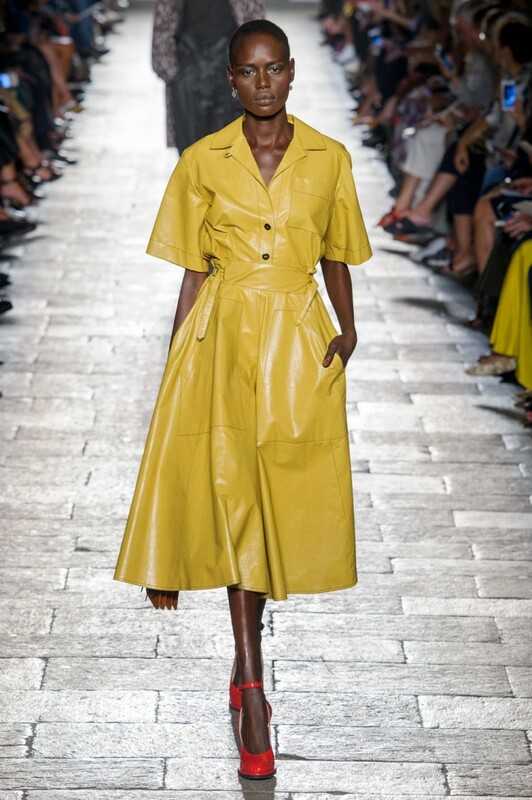 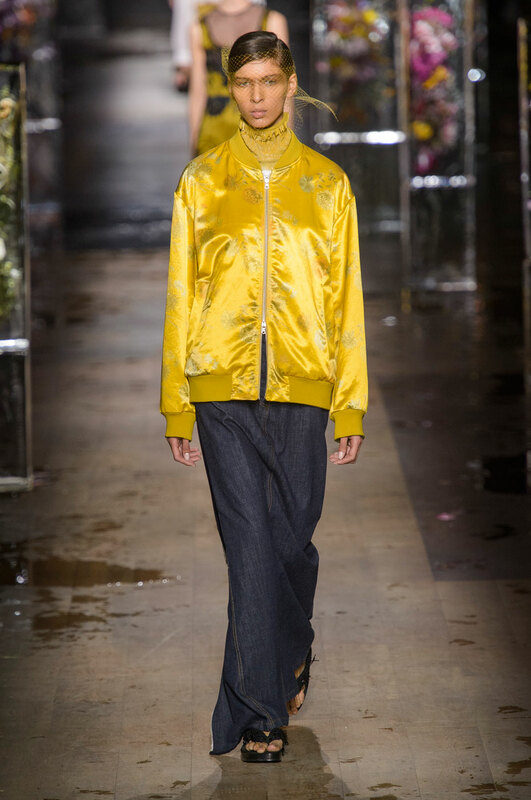 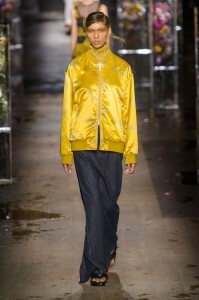 An oriental treatment of yellow was seen at Dris Van Noten; from a satin-bomber to high-rise satin trousers and a gathered panel and flared-hem skirt. Burnt-amber was the colour of choice by Vionnet, whose two-tone designs and asymmetrical outwear provided a sophisticated and sporty ambiance. 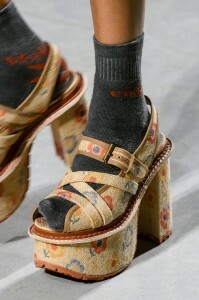 A third year student of English Literature at the University of St Andrews. 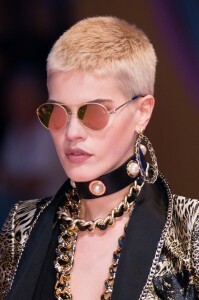 An aspiring fiction writer with a love for good food, eclectic fashion and inspired by the likes of JK Rowling, Charles Bukowski and Allen Ginsberg.